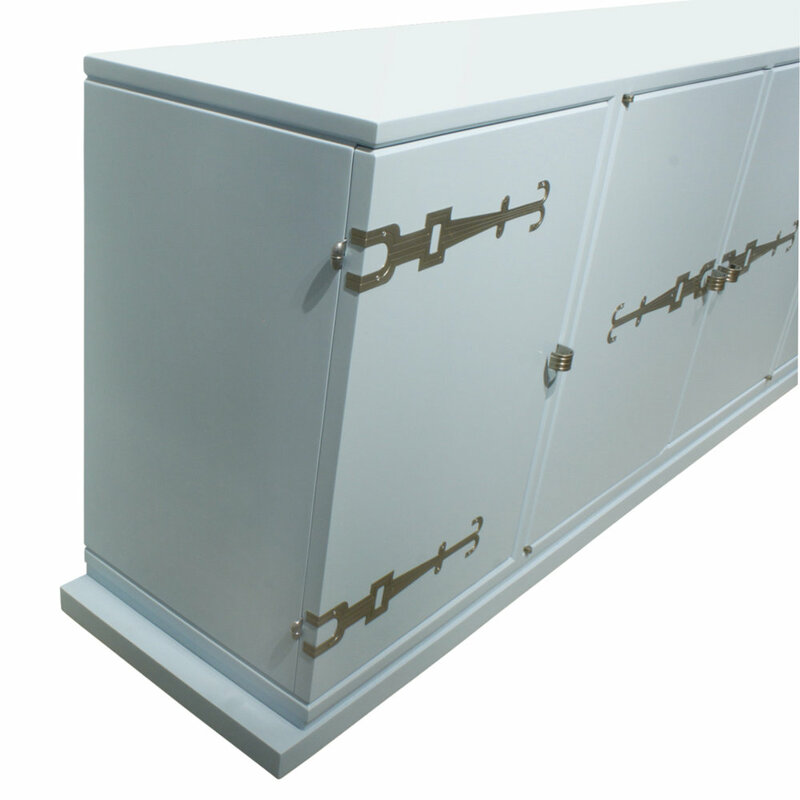 Chest of drawers No. 5039 in dark walnut by T.H. 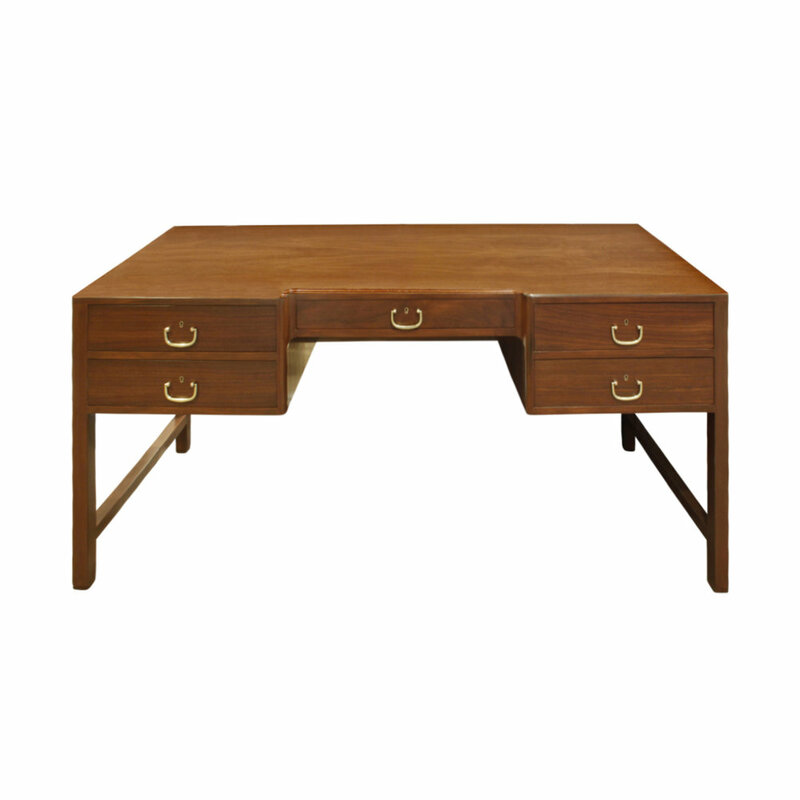 Robsjohn-Gibbings for Widdicomb, American 1950's (label in drawer "Widdicomb designed by T.H. Robsjohn-Gibbings"). 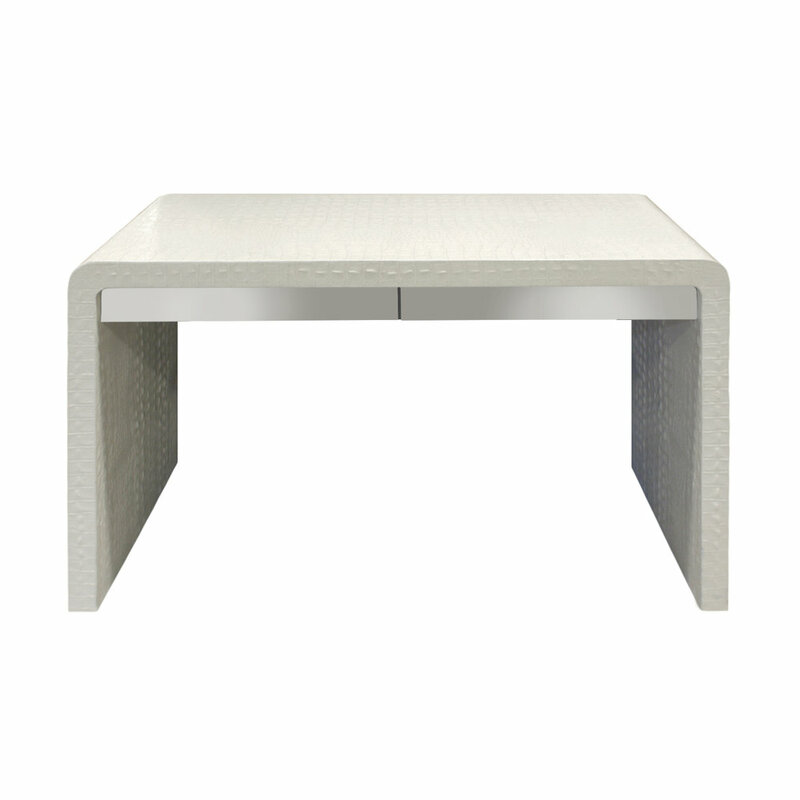 The framed out design is beautiful and this piece has deep drawers. 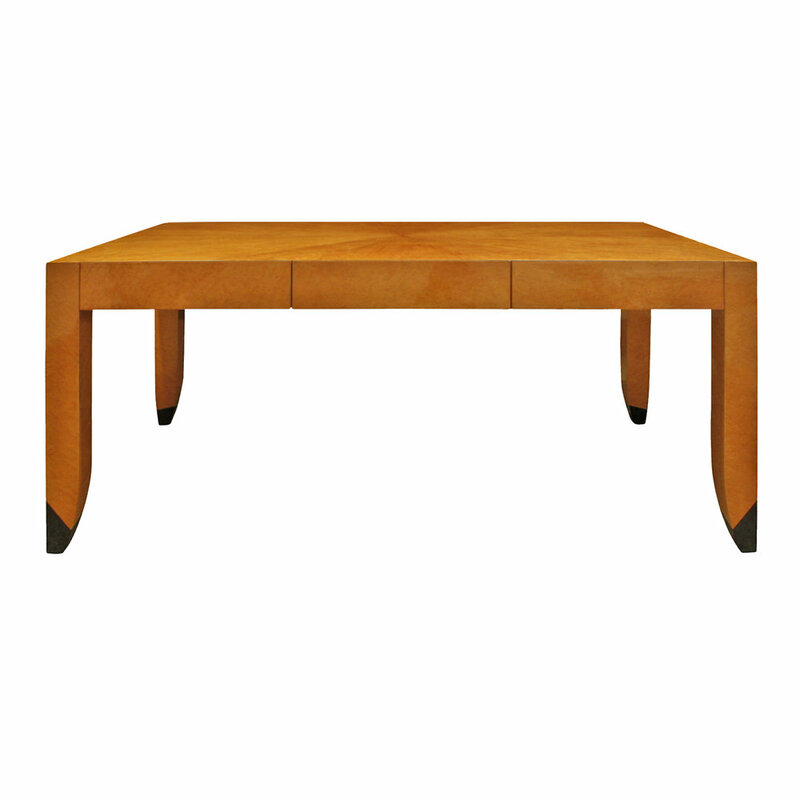 Rare and important "Bristol Desk" with 3 drawers in birdseye maple with sunburst inlay on top and black sabots by Karl Springer, American ca 1985. 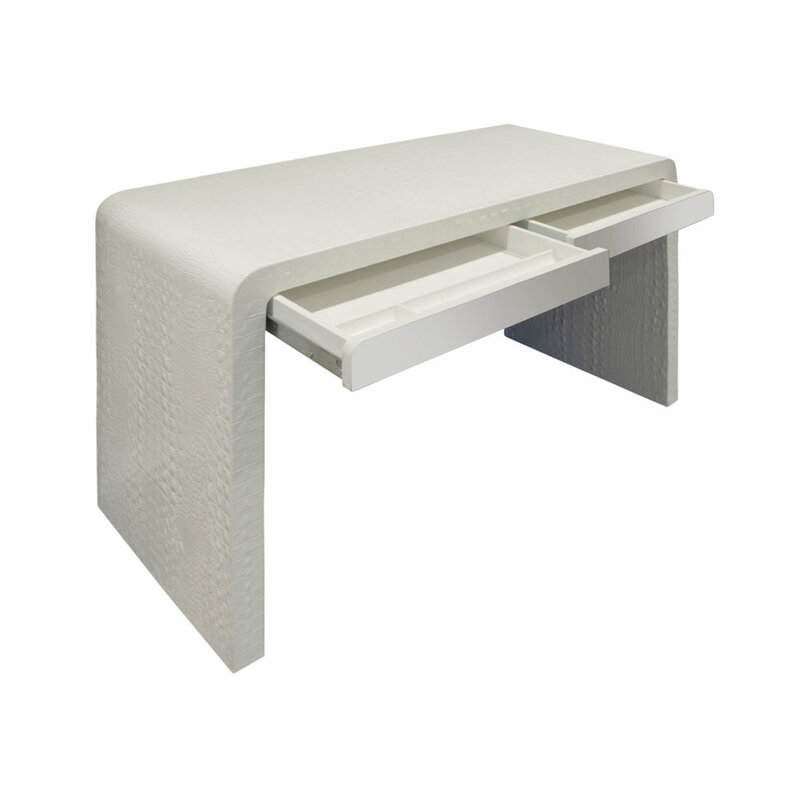 Drawers lined in moire. 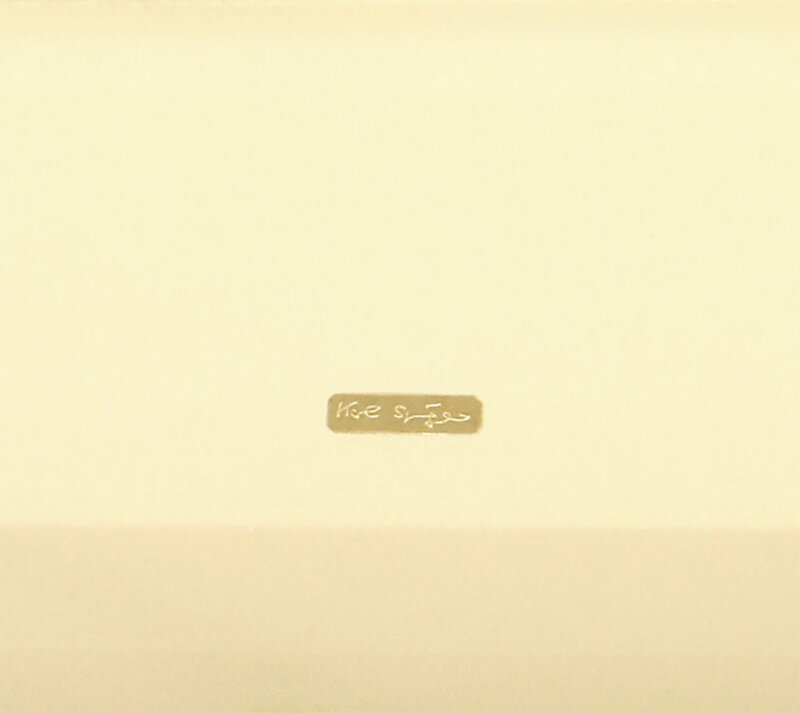 Signed on bottom with Karl Springer brass label. Meticulously crafted and very beautiful. 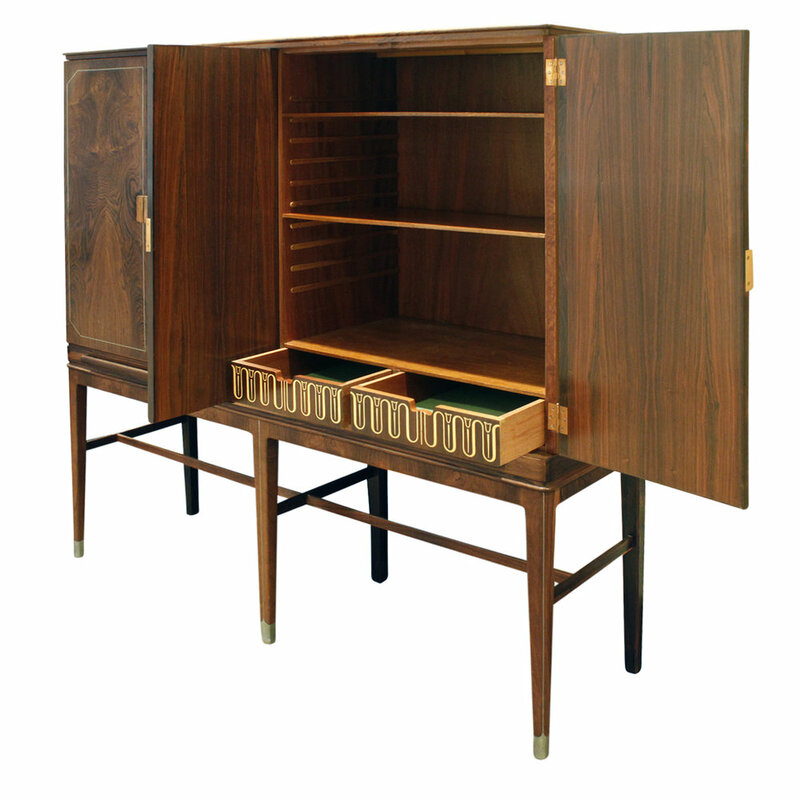 Cabinet 864B in mahogany with black leather and brass trim and pulls, 2 sliding doors and 5 drawers, by Harvey Probber, American 1950's. 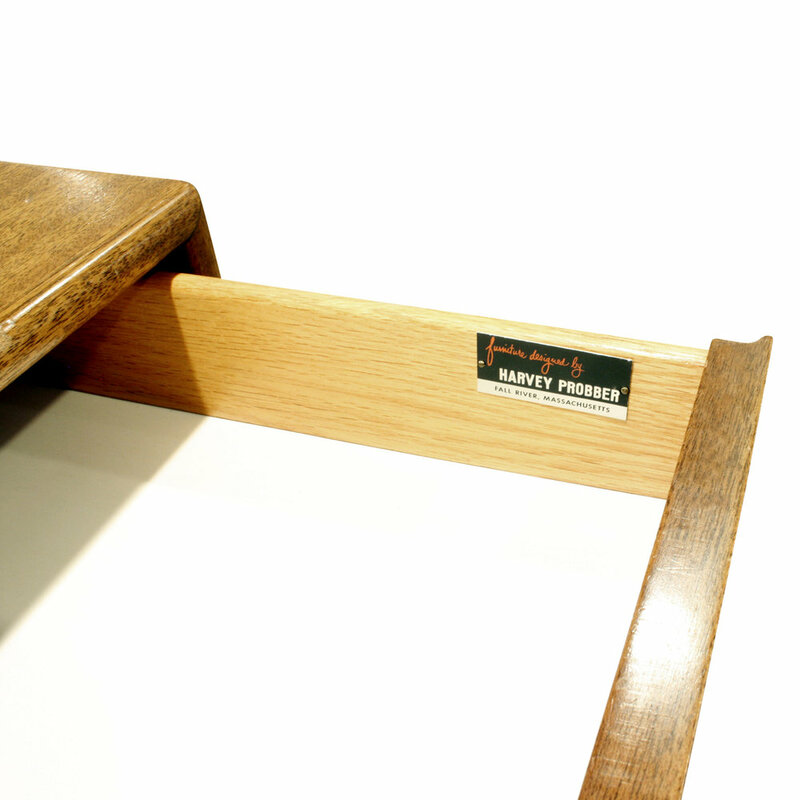 Signed with metal label that reads “Furniture designed by Harvey Probber” in top drawer. 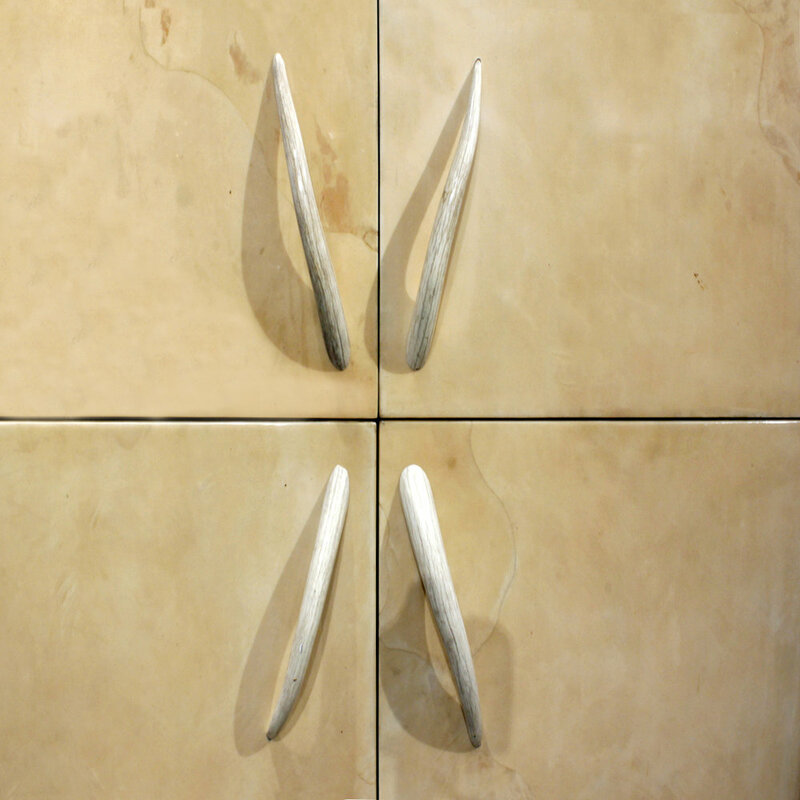 Pull out shelves behind doors are lacquered and lined with cork. 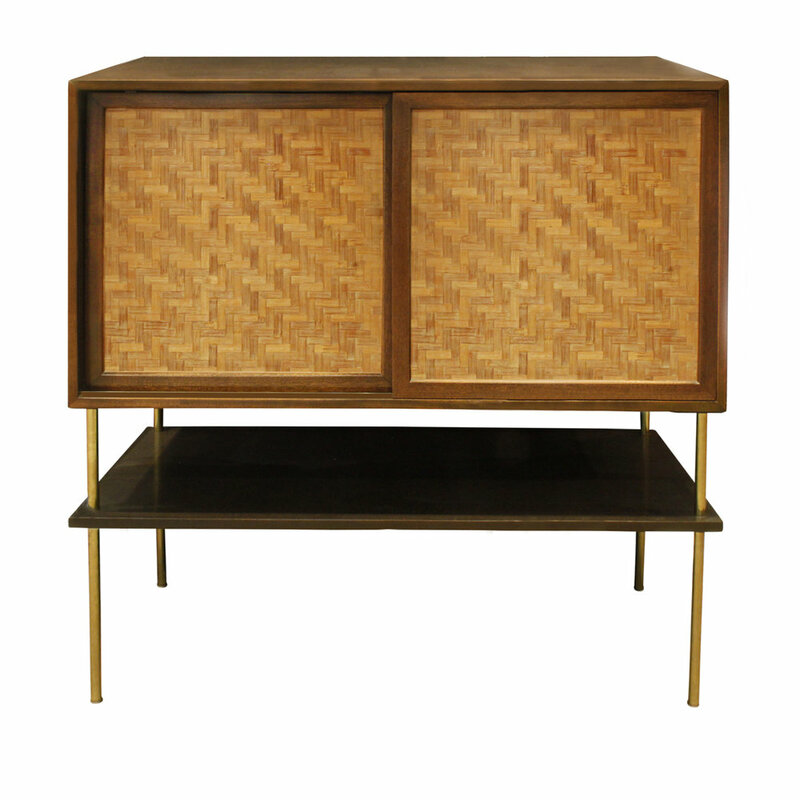 This pieces is beautifully made and very chic. 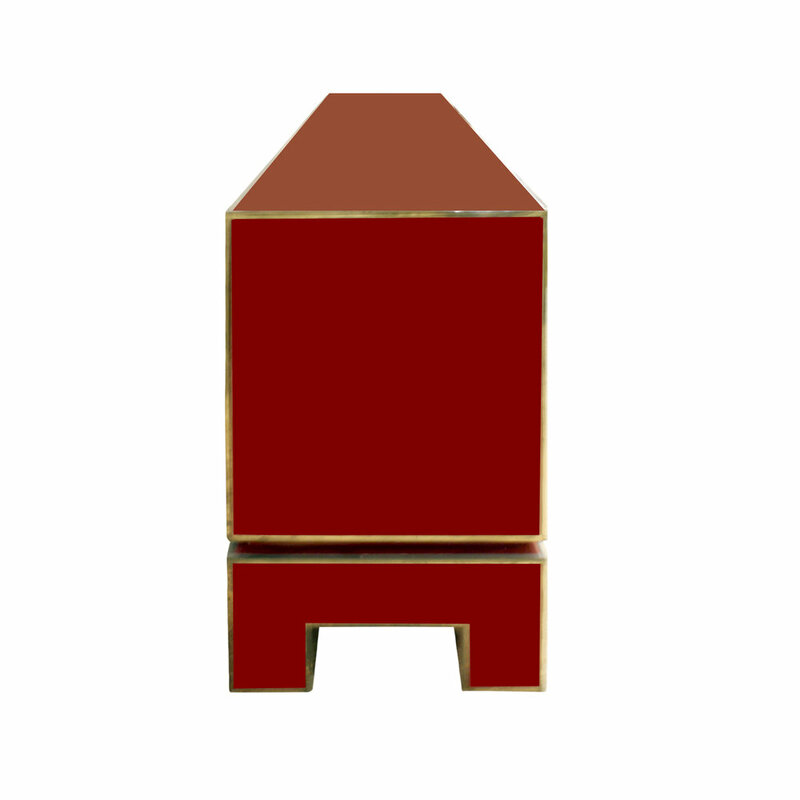 Cabinet model no. 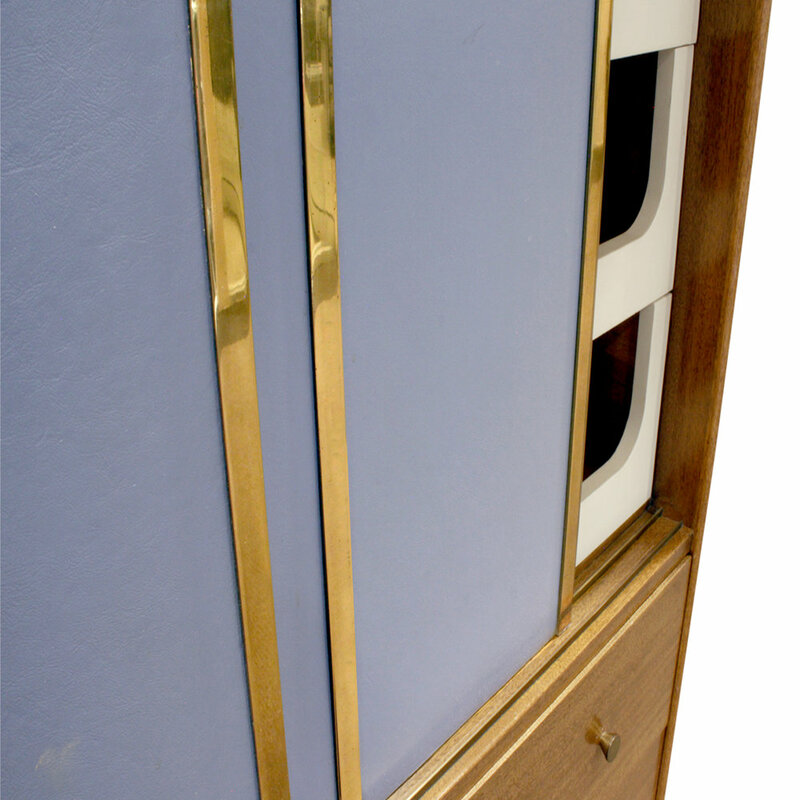 8906 on tall tapering legs in book-matched Brazilian rosewood with inlays and pulls in eight-carat white gold plate over copper by Georg Kofoed, Denmark 1930s. 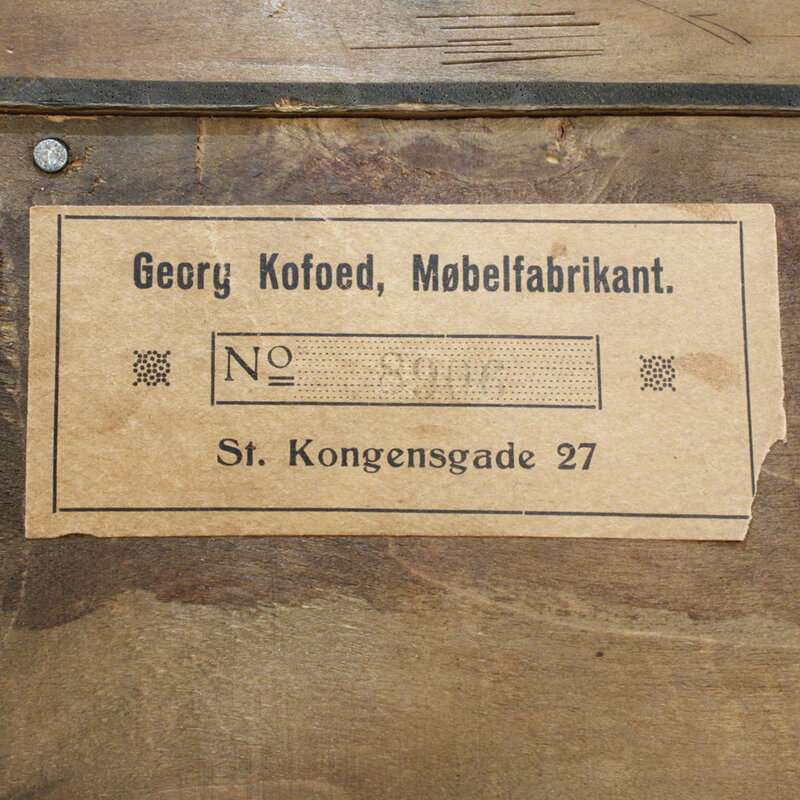 Comes with label on the back that reads “Georg Kofoed, Mobelfabrikant St. Kongensgade 27”. 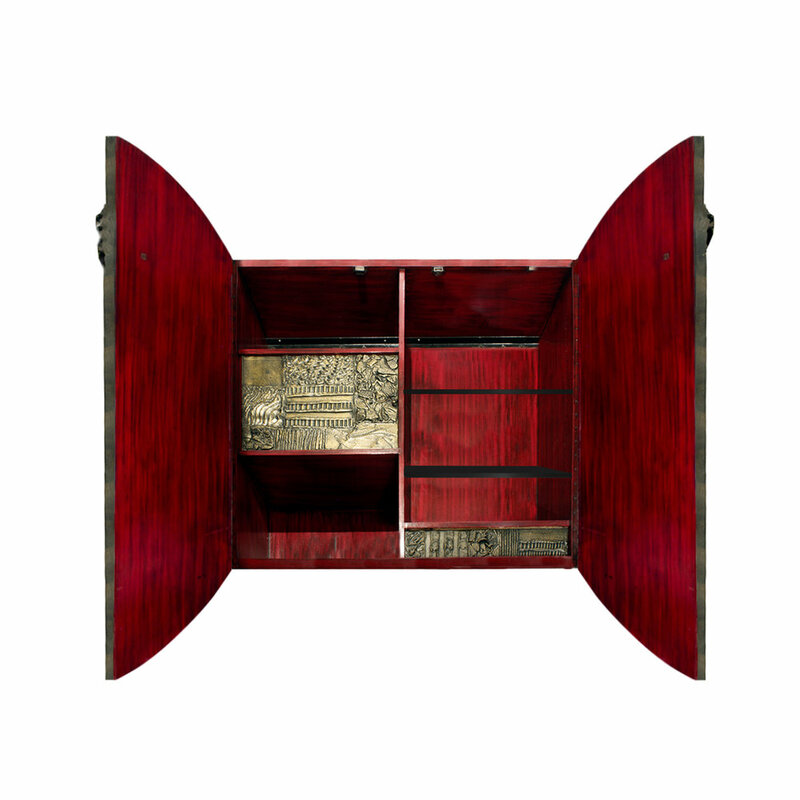 This is cabinet is meticulously crafted and the rosewood is stunning. 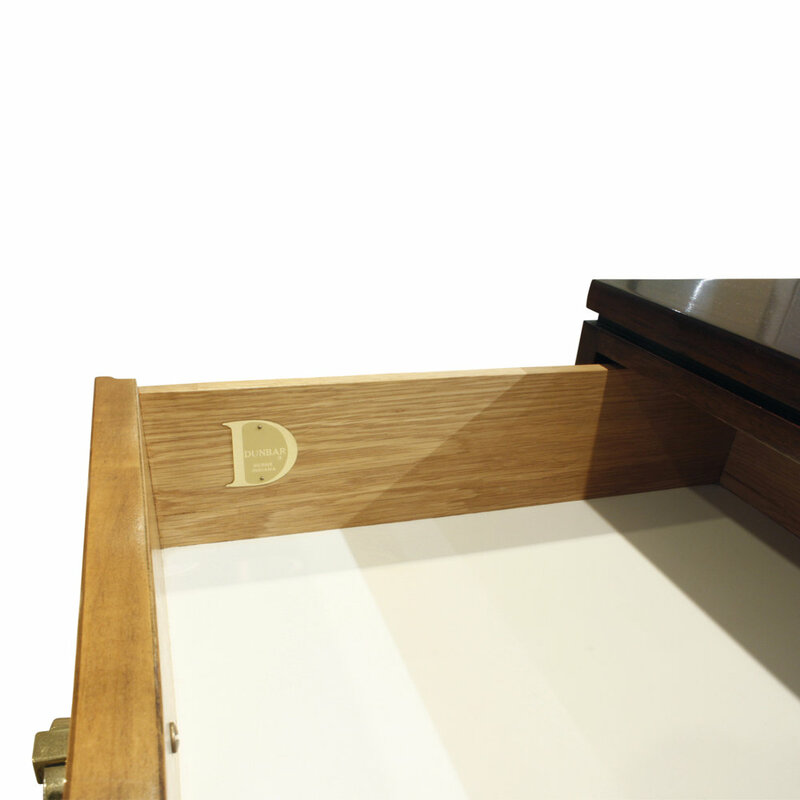 Interior drawers have beautiful birch inlays. 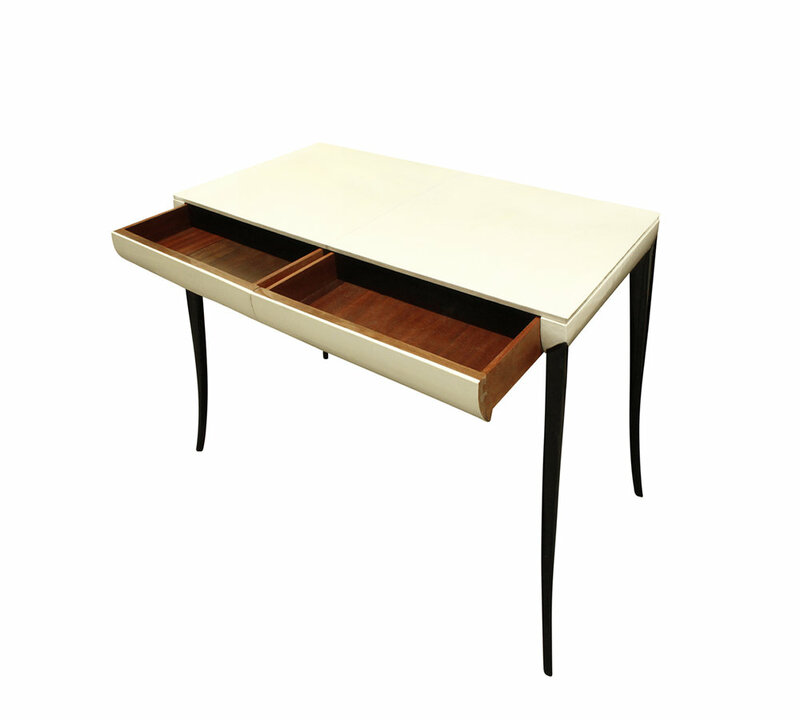 Stylish writing desk, top in lacquered parchment with tapering ebonized legs, Italian 1930's. 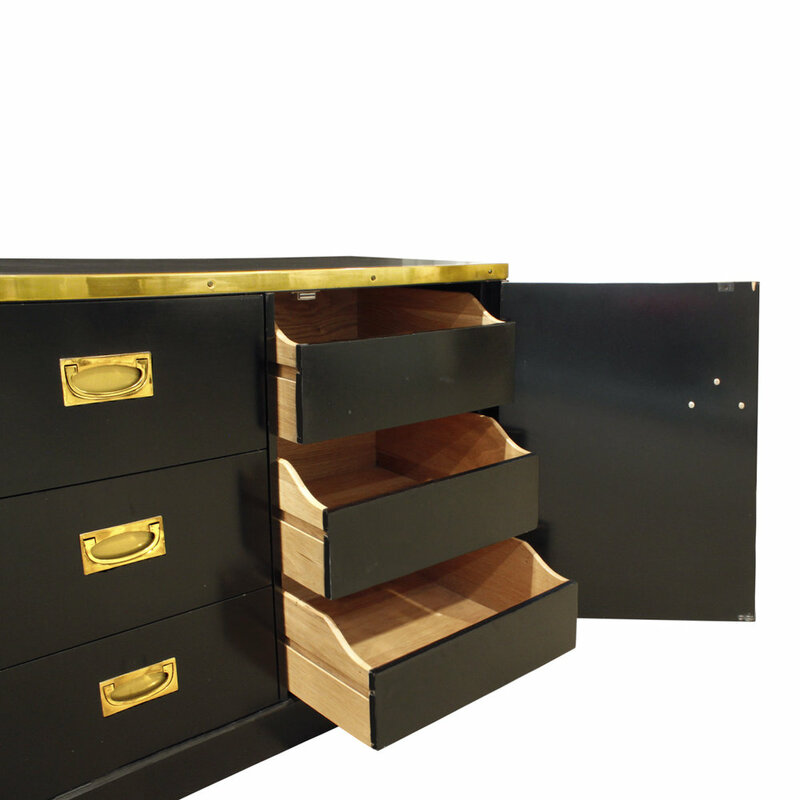 This desk has 2 drawers and is very chic. 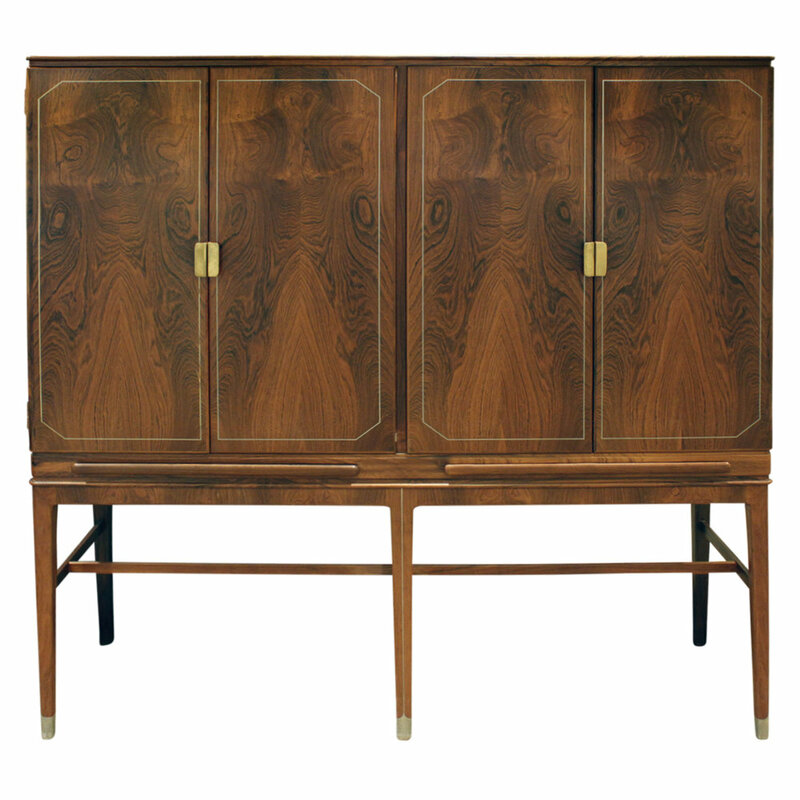 Bar cabinet in mahogany with inset caned doors on brass legs with lower shelf by Harvey Probber, American 1950's. 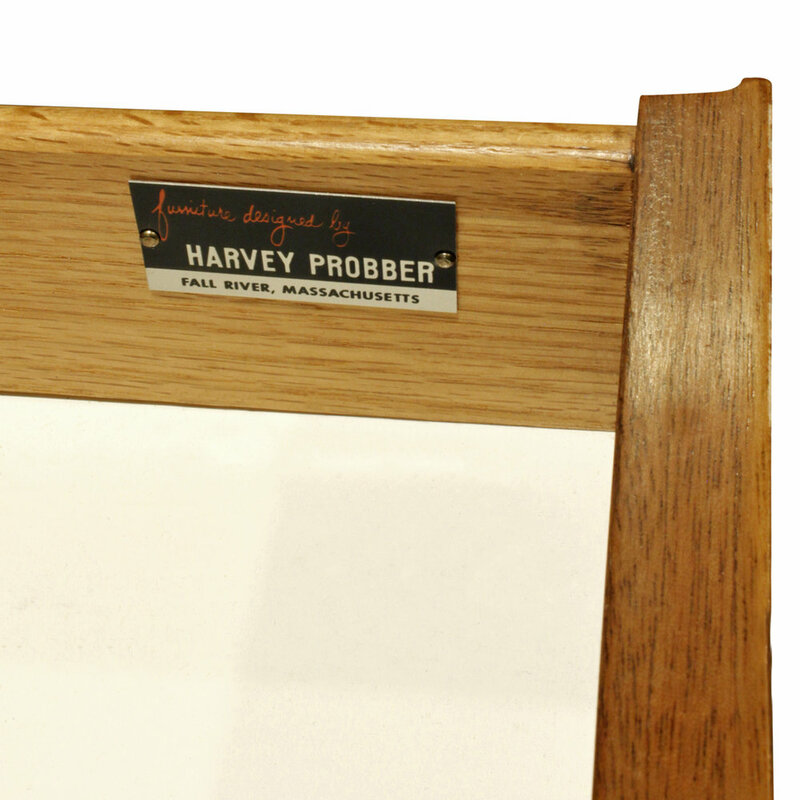 Signed with metal label that reads “Designed by Harvey Probber” located on top interior drawer on right side. 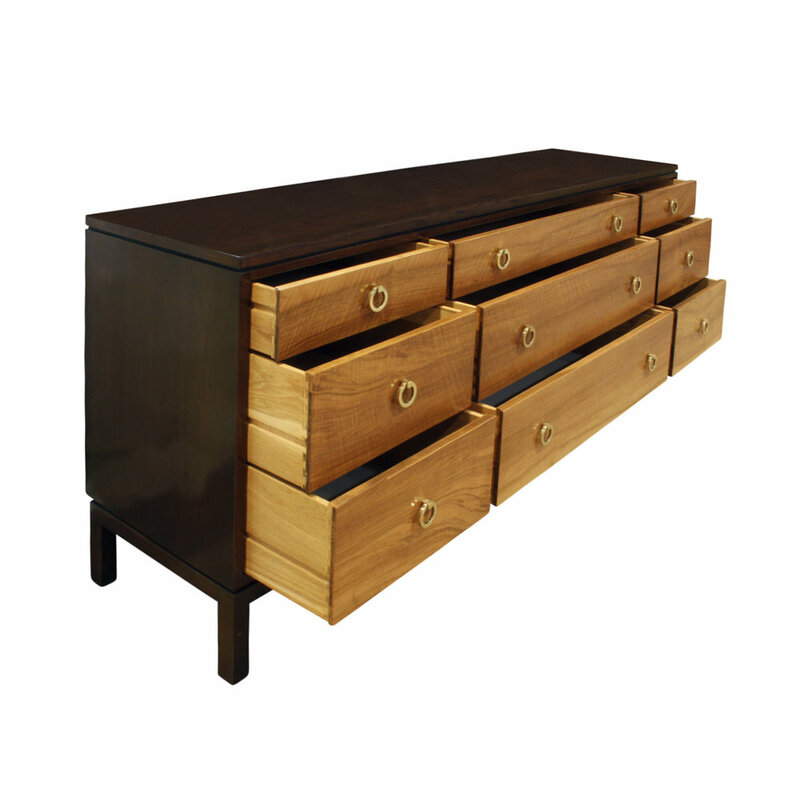 The drawers are lacquered with offset pulls. A beautiful design. 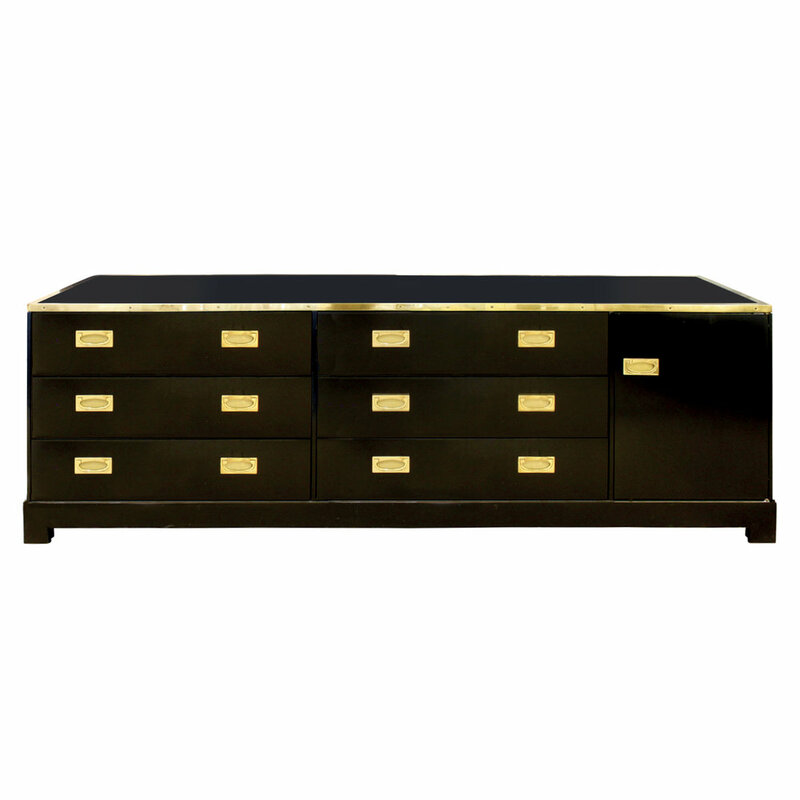 Elegant chest of drawer in black lacquer with brass banding and pulls attributed to Alain Delon for Maison Jansen, France 1970's. 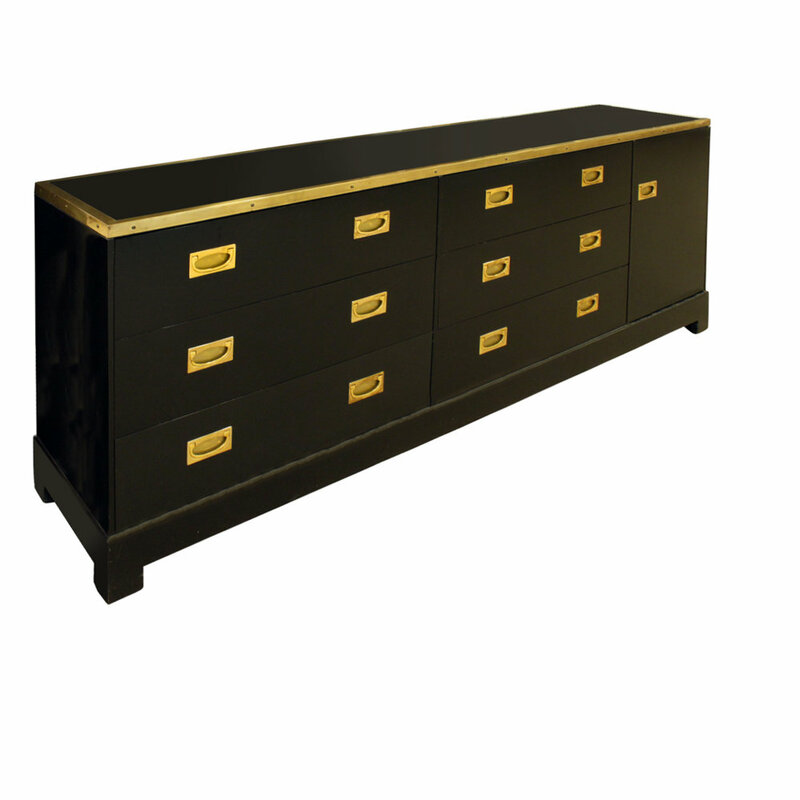 This chest of drawers is beautifully made and very chic. 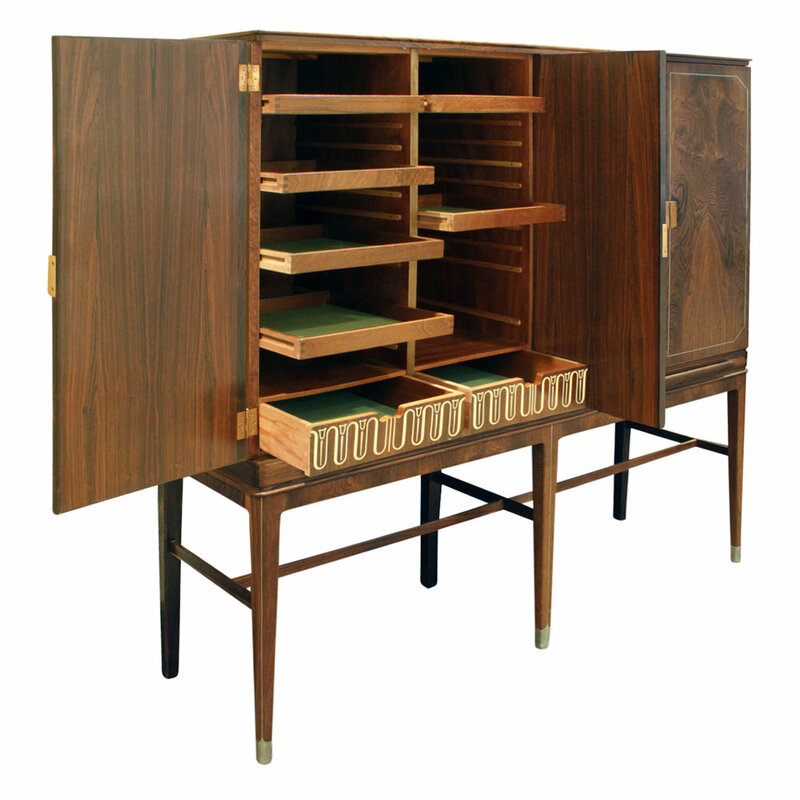 Cabinet 864B in mahogany with blue leather and brass trim and pulls, 2 sliding doors and 5 drawers, by Harvey Probber, American 1950's. Metal label inside top right drawer reads “Furniture Designed by Harvey Probber / Fall River, Massachusetts”. 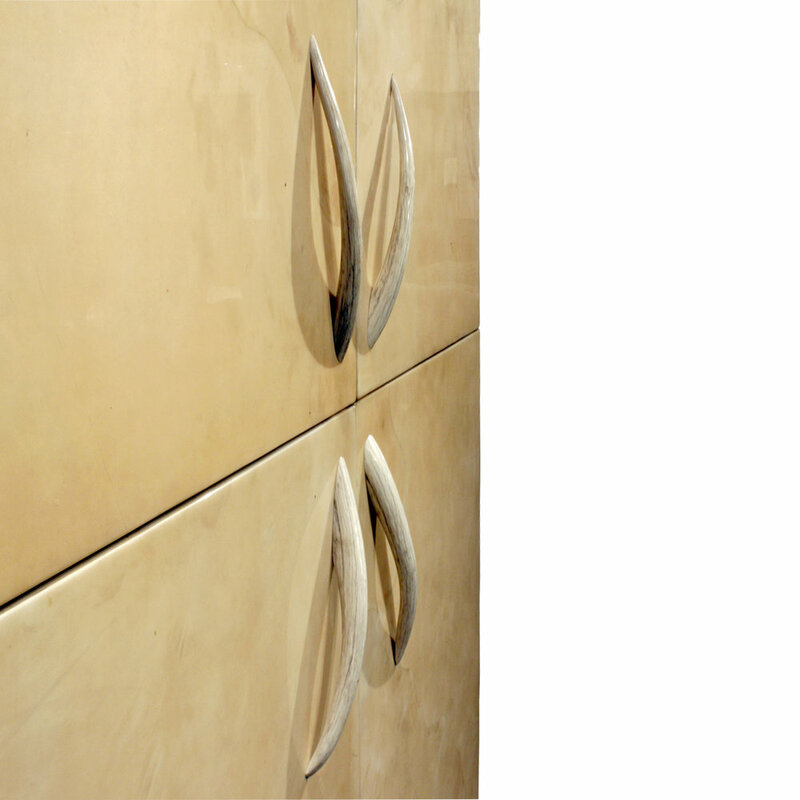 The interior has white lacquered drawers with offset pulls. 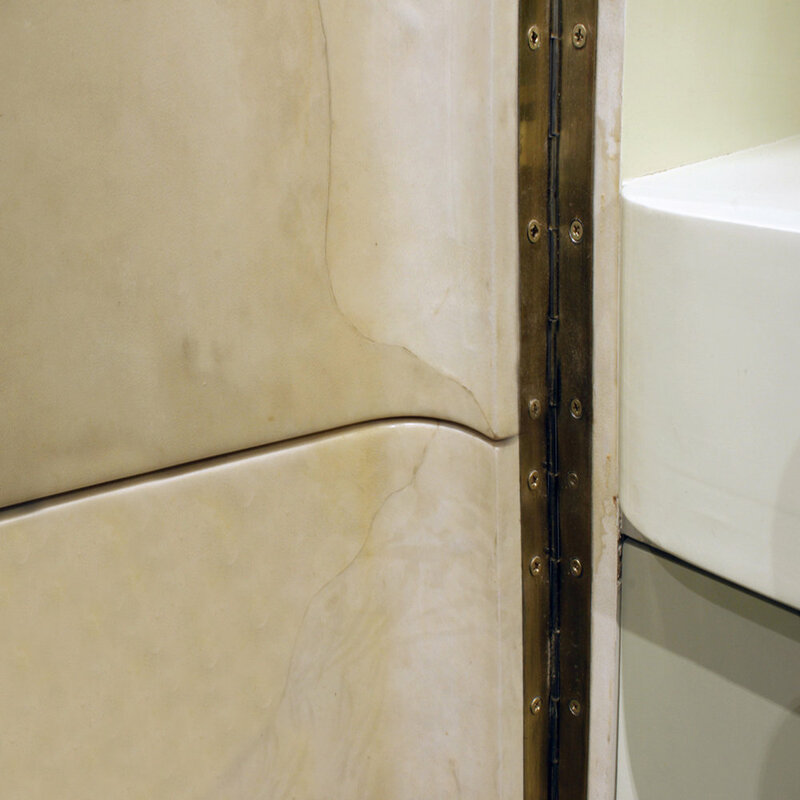 Beautifully outfitted and meticulously crafted. 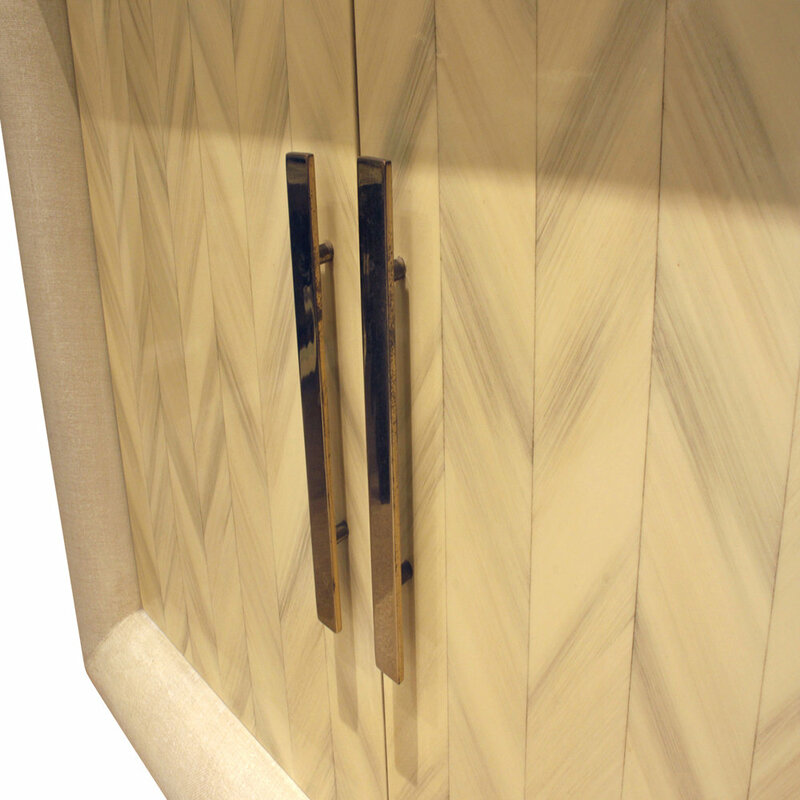 This cabinet has been refinished and restored by Lobel Modern. 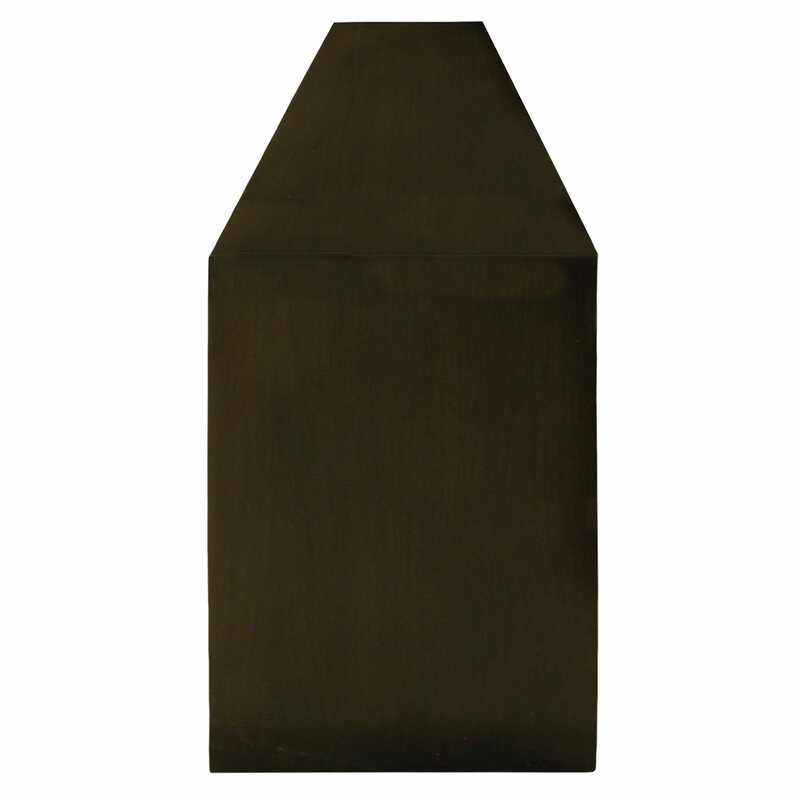 Tall chest model no. 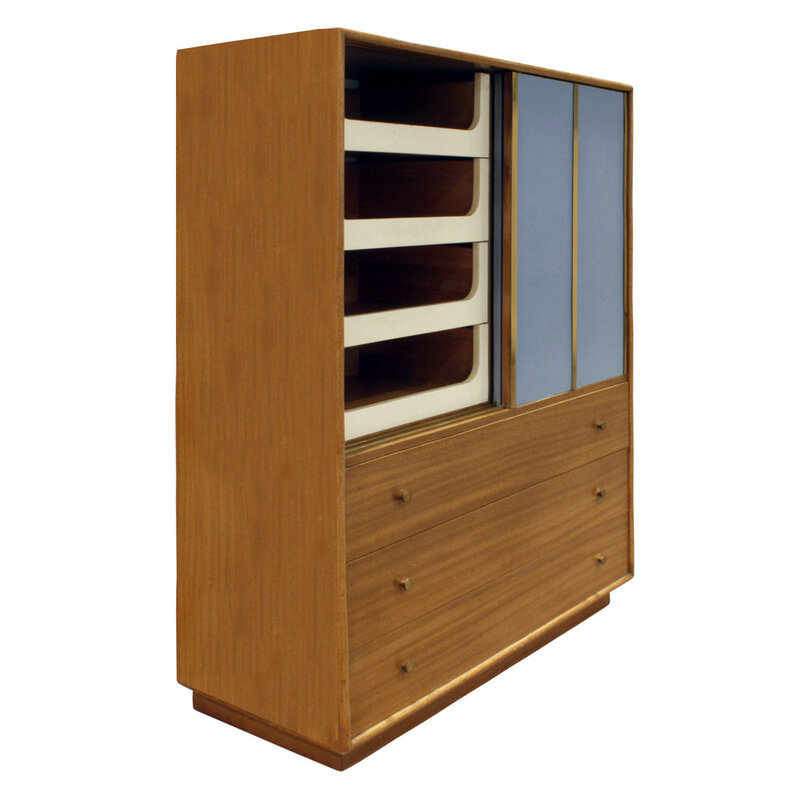 865B in mahogany with blue leather doors and brass trim and pulls, beautifully outfitted, by Harvey Probber, American 1950's. 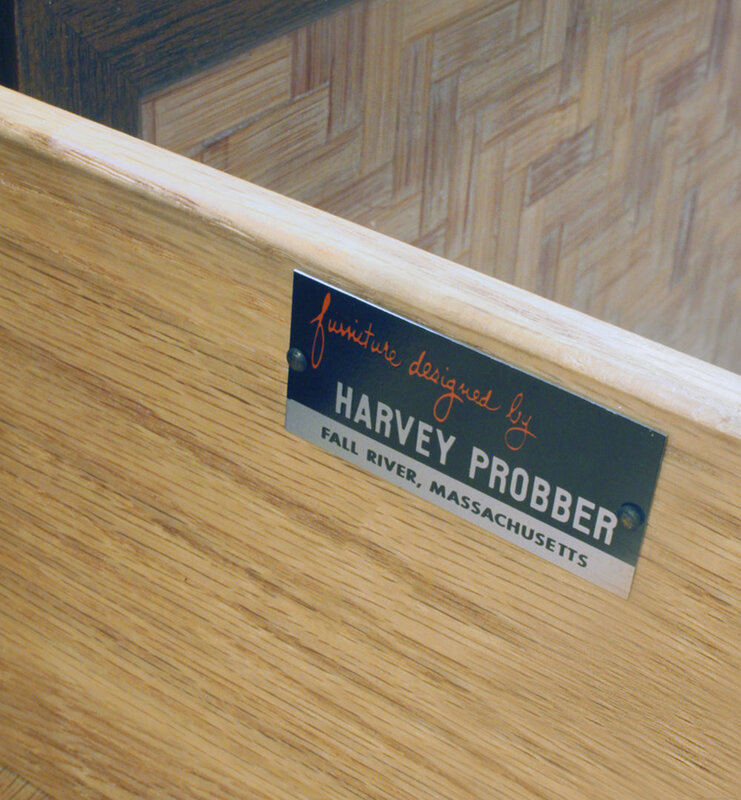 Metal label inside top right drawer reads “Furniture Designed by Harvey Probber / Fall River, Massachusetts”. 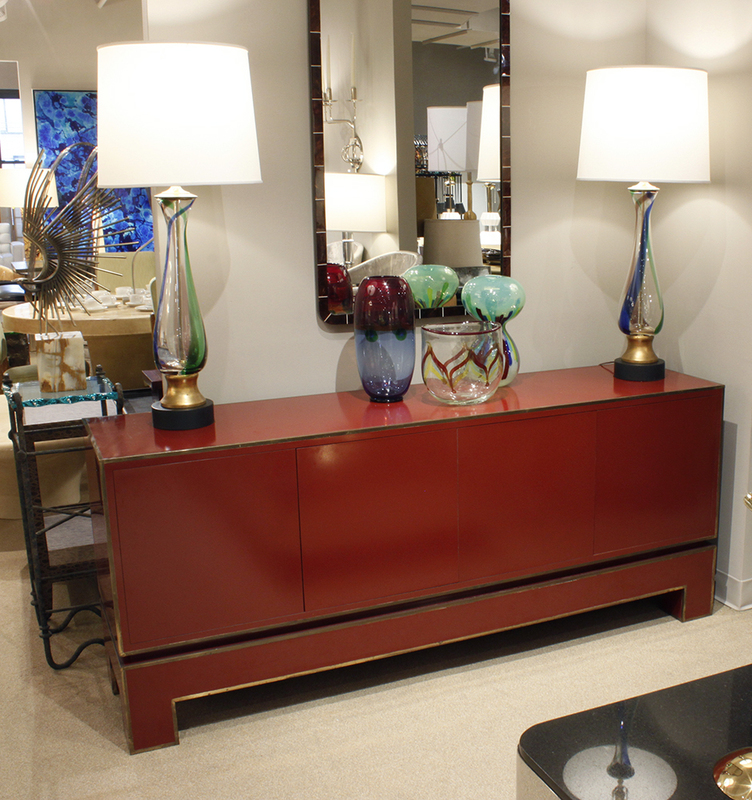 The combination of blue with the brass and mahogany is very chic. This piece is meticulously crafted. 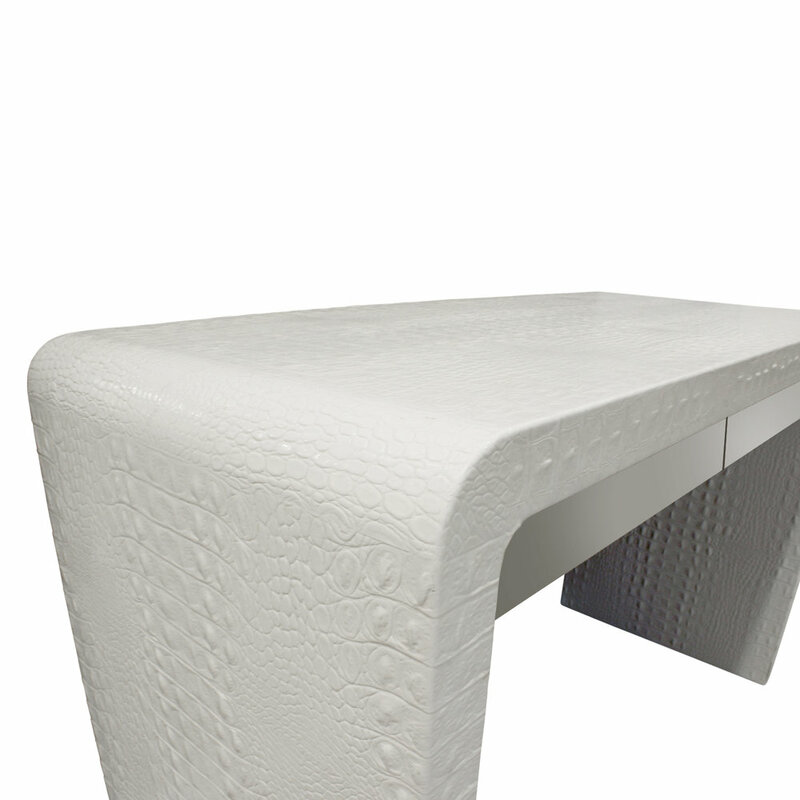 Writing desk covered in white embossed crocodile leather with stainless steel drawers by Karl Springer, American 1970's. 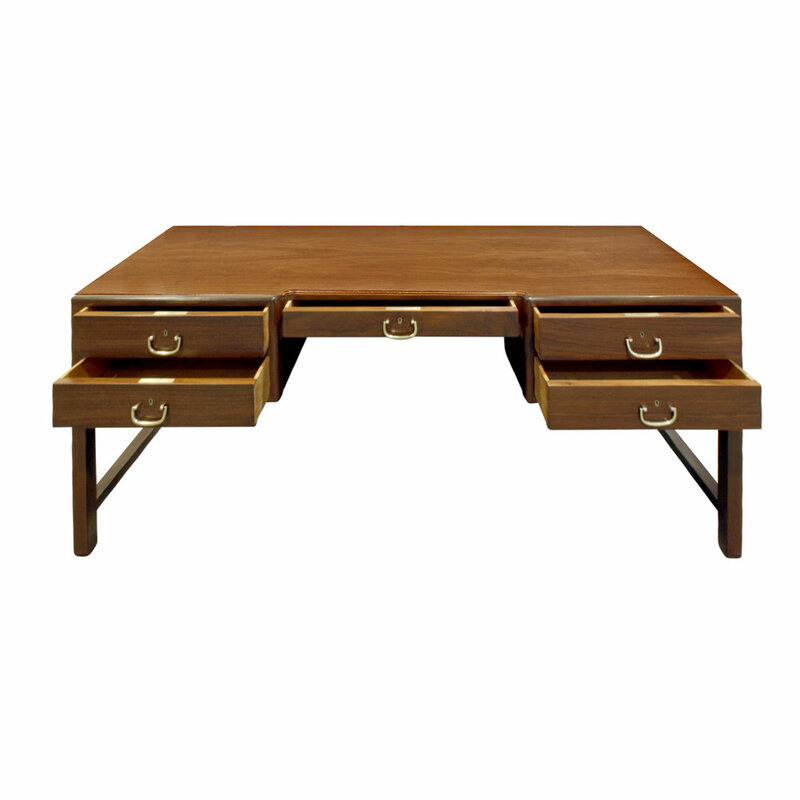 Elegant desk in figured teak with brass pulls and bookshelf space on the back, Denmark 1950's. 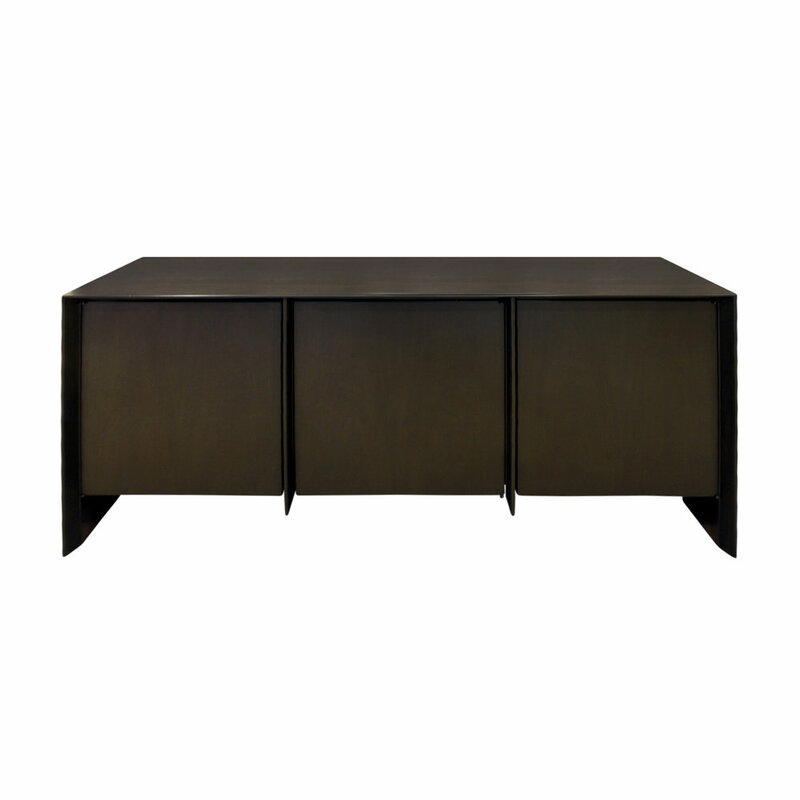 Elegant credenza model no. 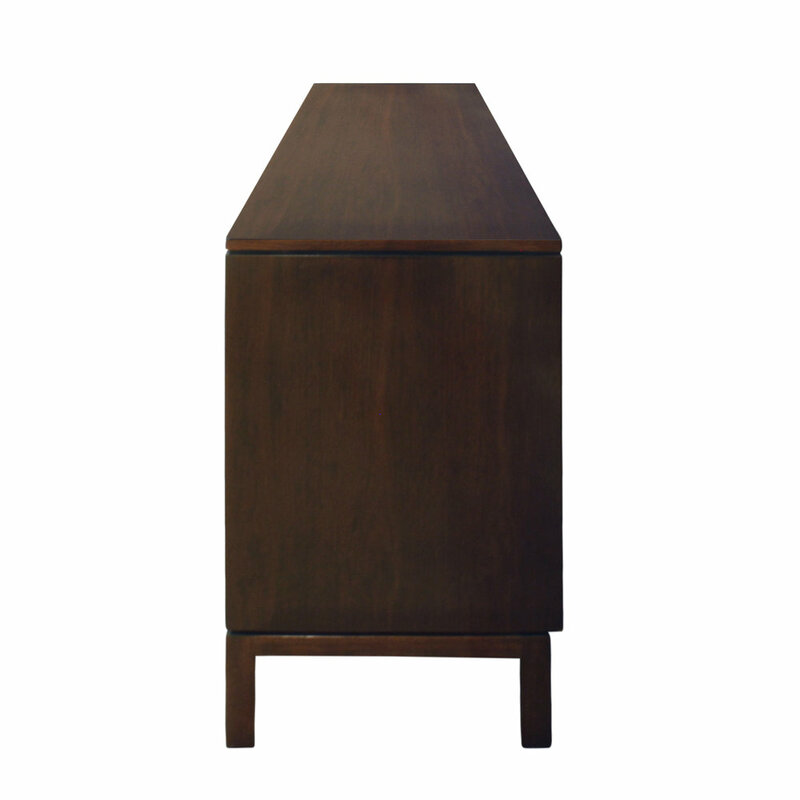 4005 in dark walnut with 3 doors by T.H. Robsjohn-Gibbings for Widdicomb, American 1950's. Label reads “Widdicomb designed by T.H. 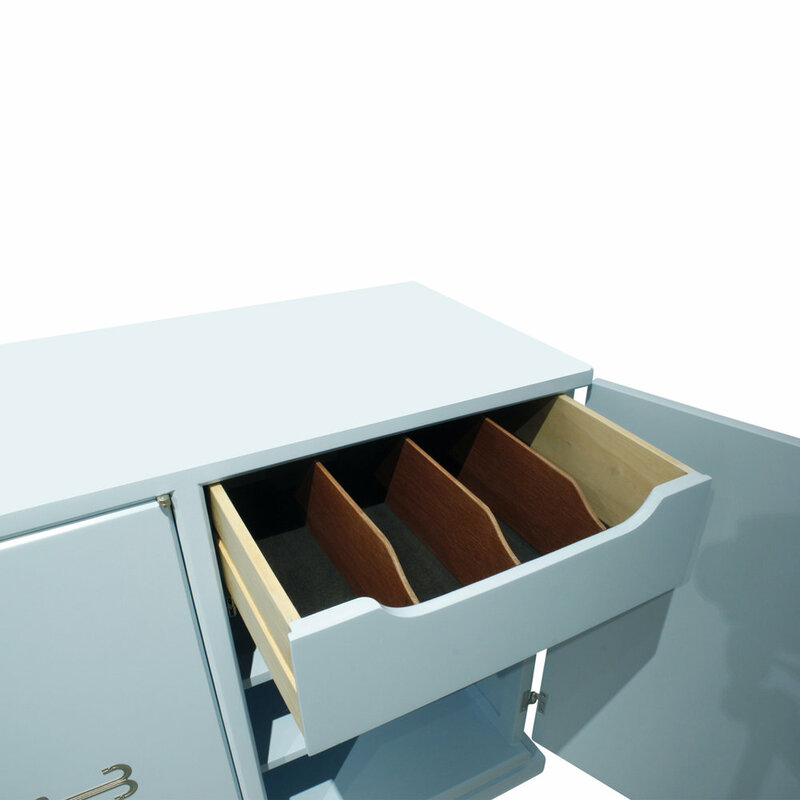 Robsjohn-Gibbings” inside middle drawer). 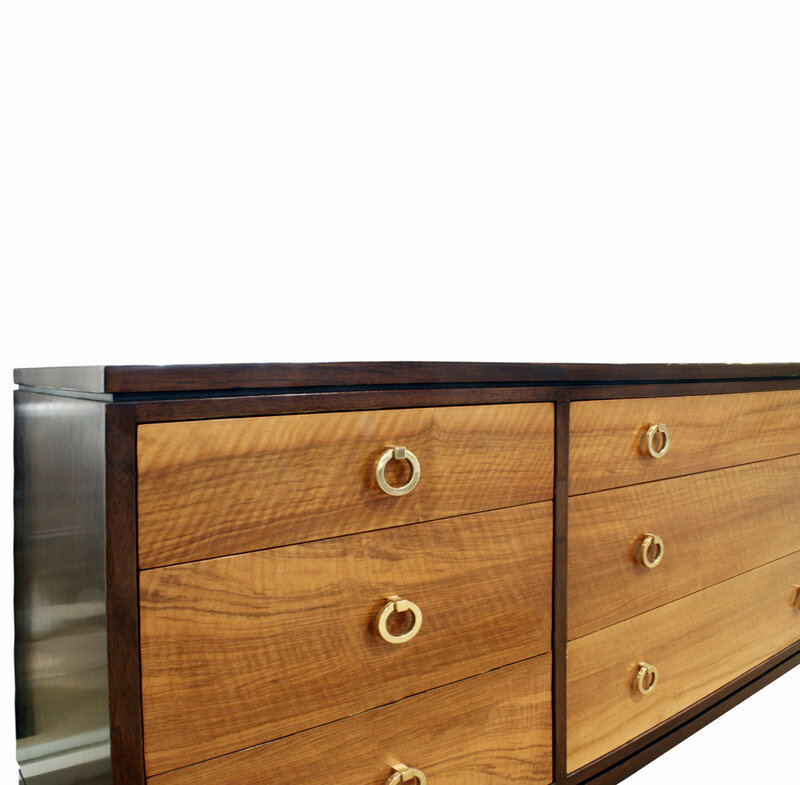 This buffet has been newly refinished by Lobel Modern. 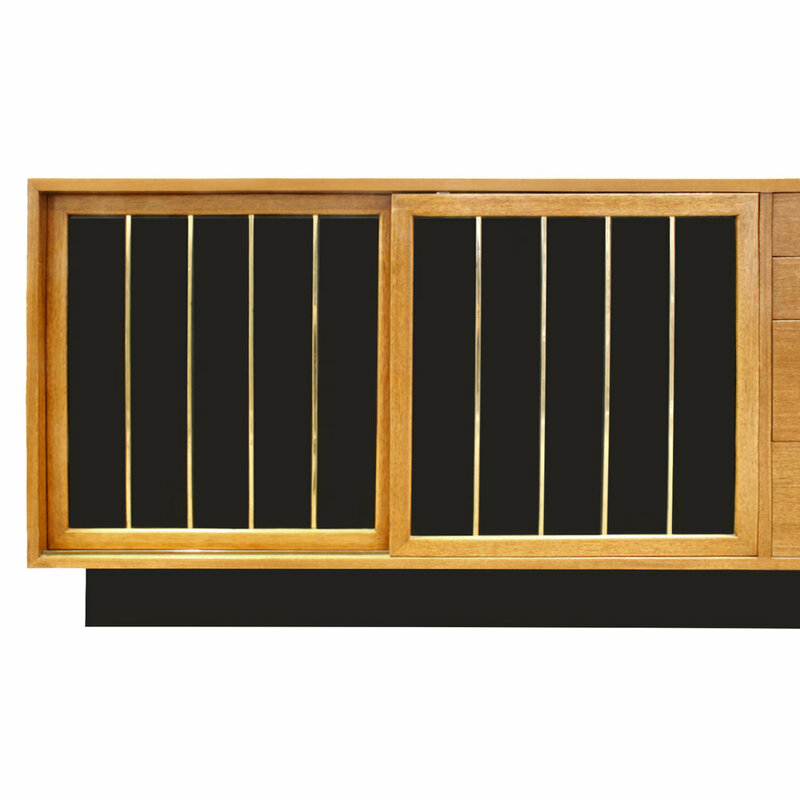 Large 4 Door credenza in lacquered linen with 4 artisan herringbone lacquer doors with brass pulls, custom design, American 1970's. 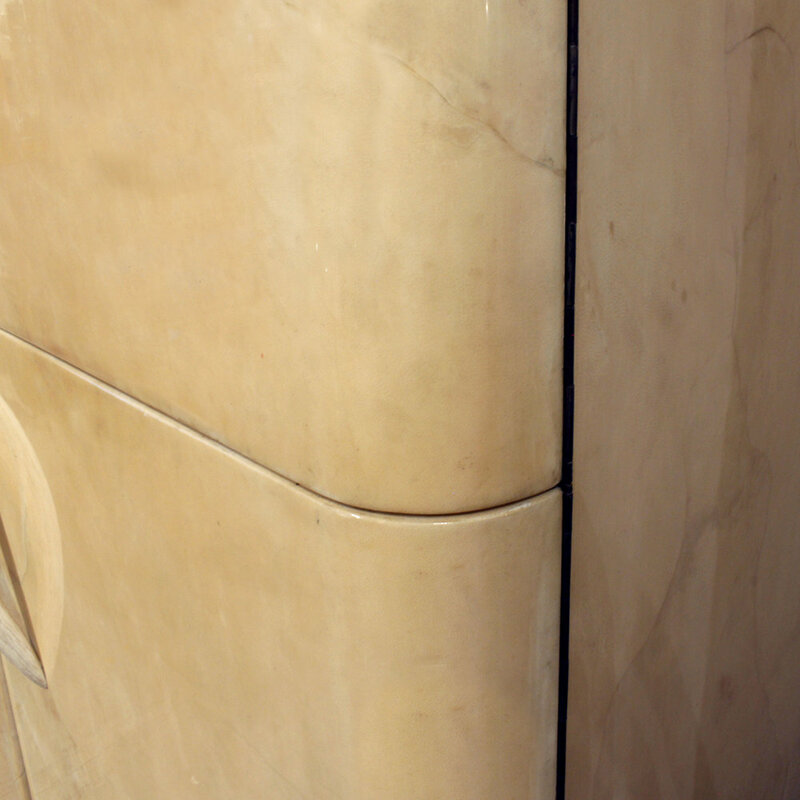 Interior drawer front panels are also lacquered linen. 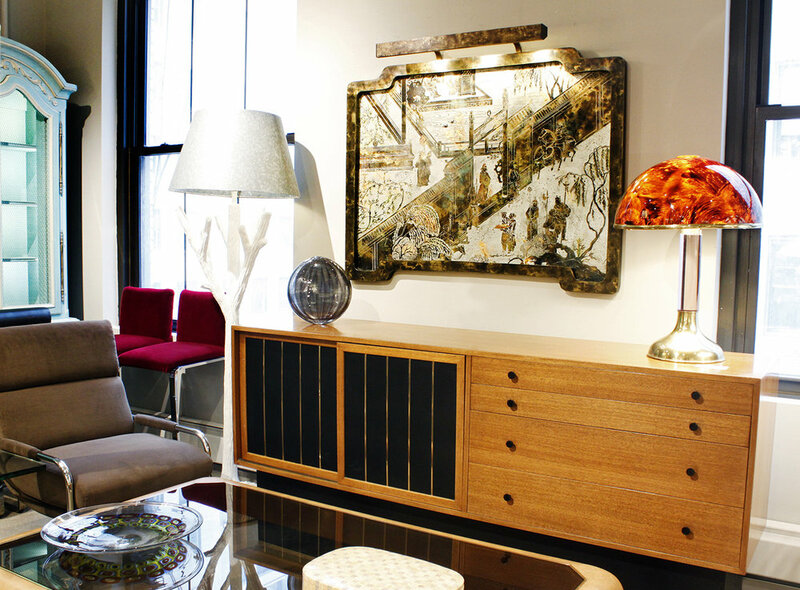 This credenza is very chic. Long chest model No. 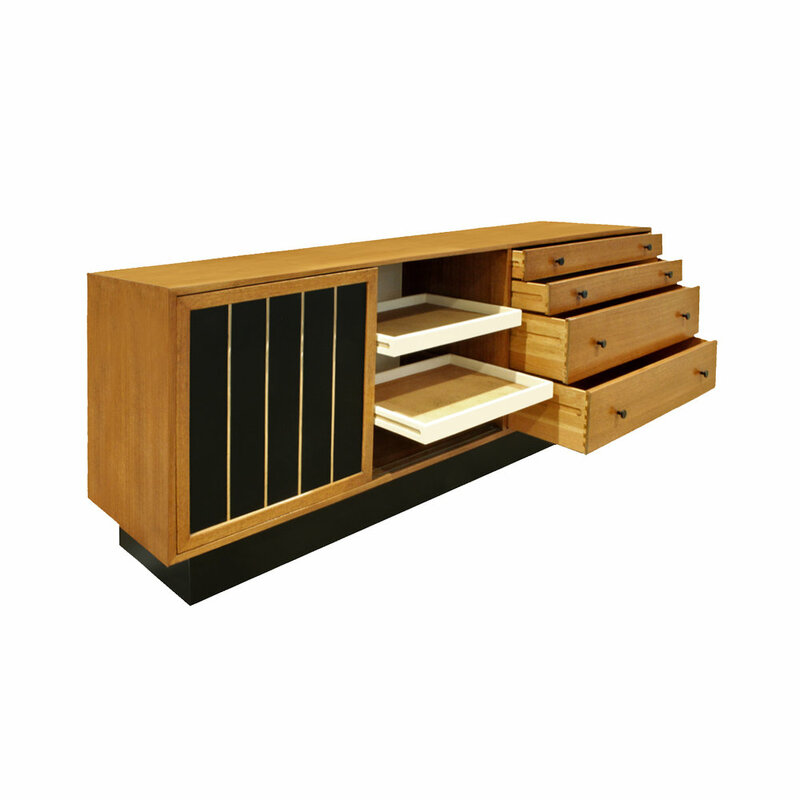 6423 in mahogany with drawer fronts in French walnut with brass ring pulls by Edward Wormley for Dunbar, American 1964 (Brass label in left interior drawer reads “Dunbar, Berne, Indiana” and paper label on the back reads “Dunbar Furniture Corporation”. 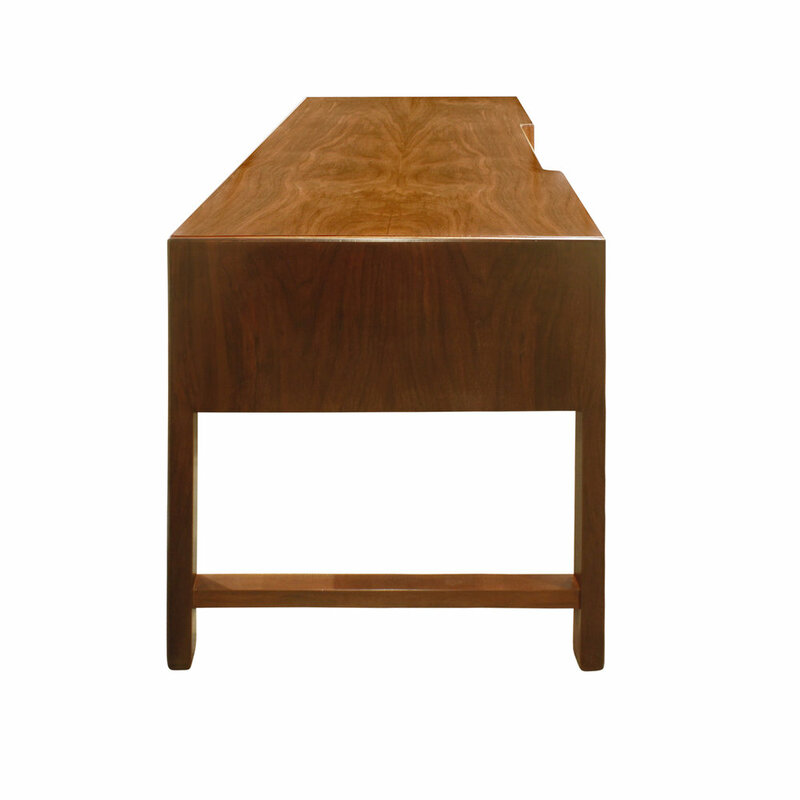 This chest is beautifully crafted. 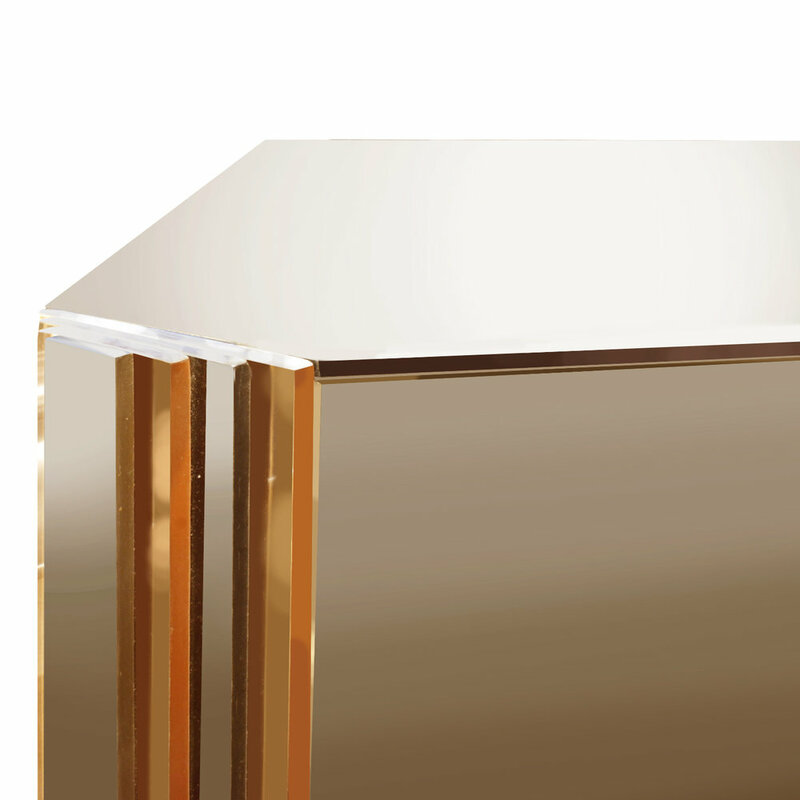 4 Door credenza in bronze glass with peach glass accents on corners by Rougier, Canada 1970's (metal label on left side reads “Rougier”). This piece is beautifully made. 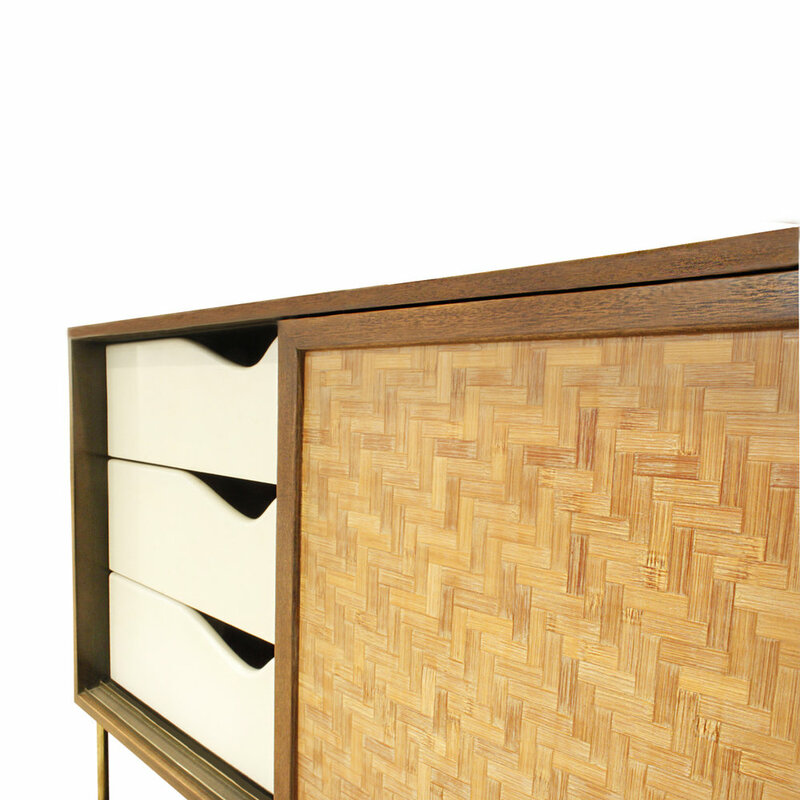 Rare large 4 Door cabinet covered in lacquered goatskin with animal horn handles by Karl Springer, American 1970's. 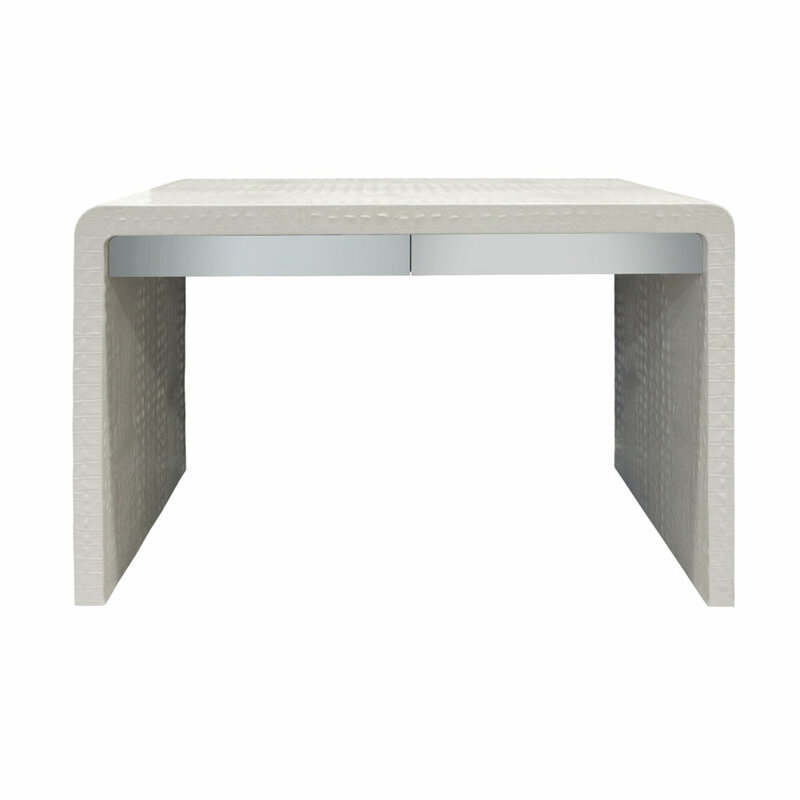 It is currently designed for a TV on top and has deep drawers on the bottom. 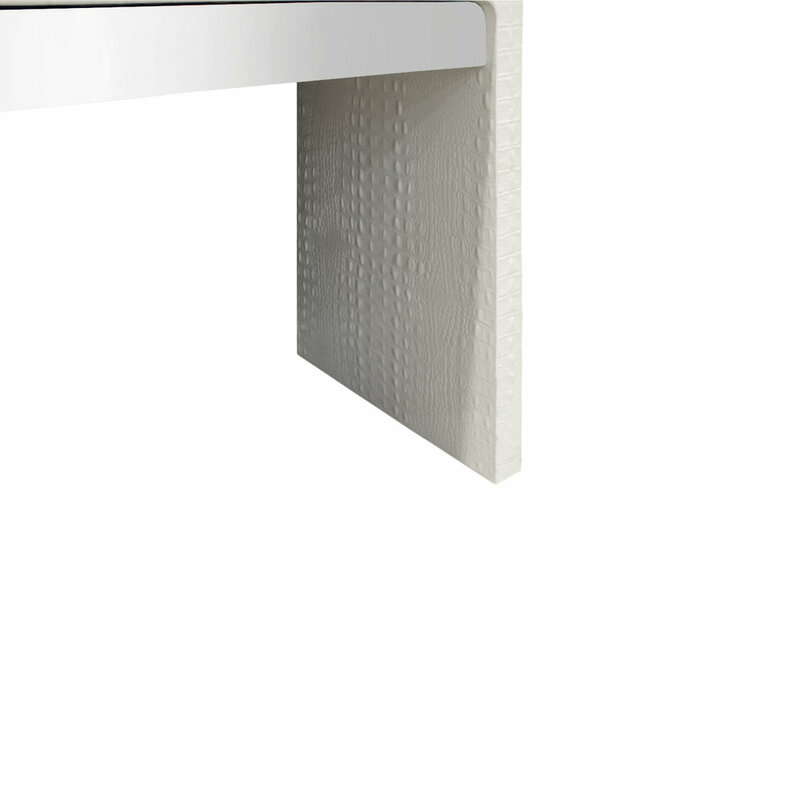 We can refit the interior spaces to spec. 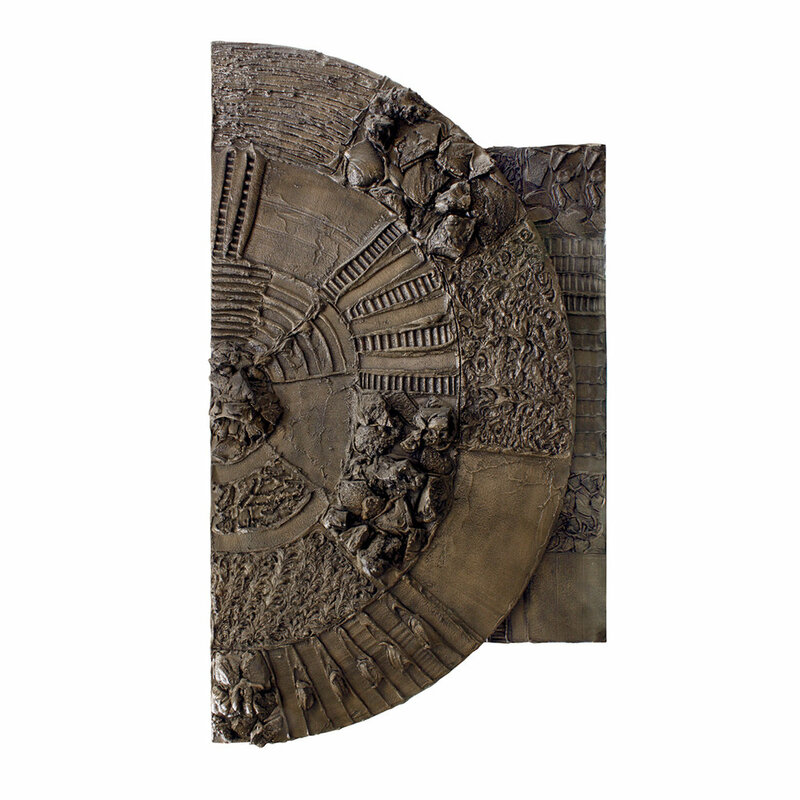 This piece is meticulously crafted and is impressive in scale. 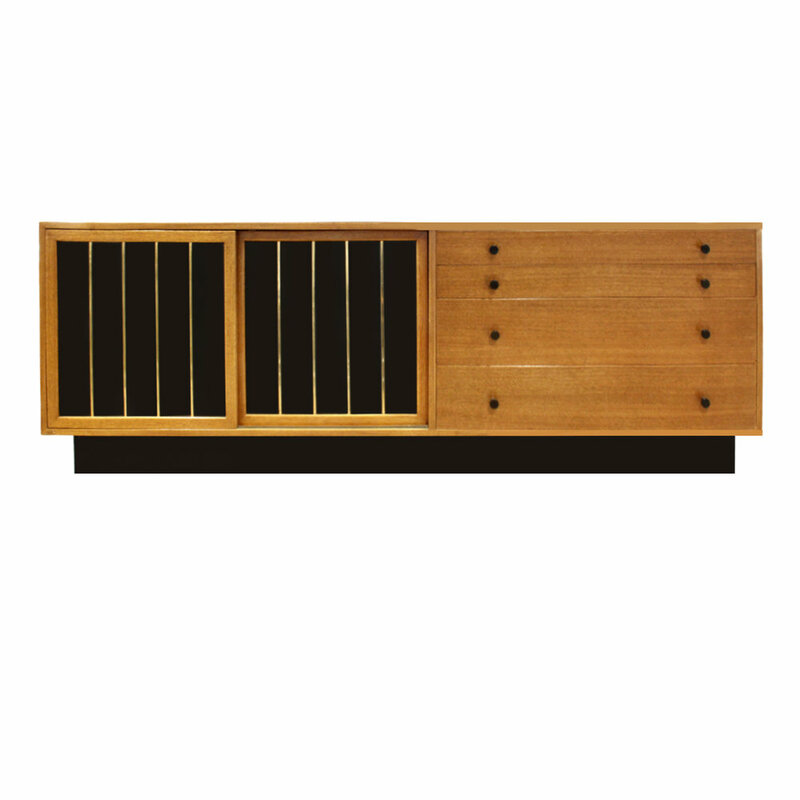 Reference: A 2 door version of this cabinet is shown in the 1970’s paperback catalog on page 60. 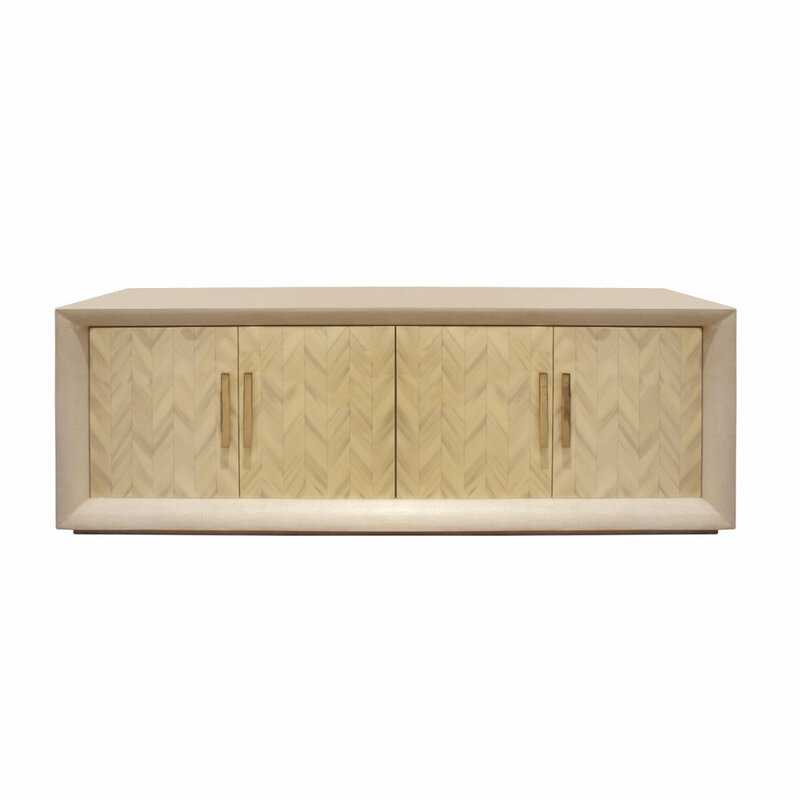 Large 4 Door cabinet model no. 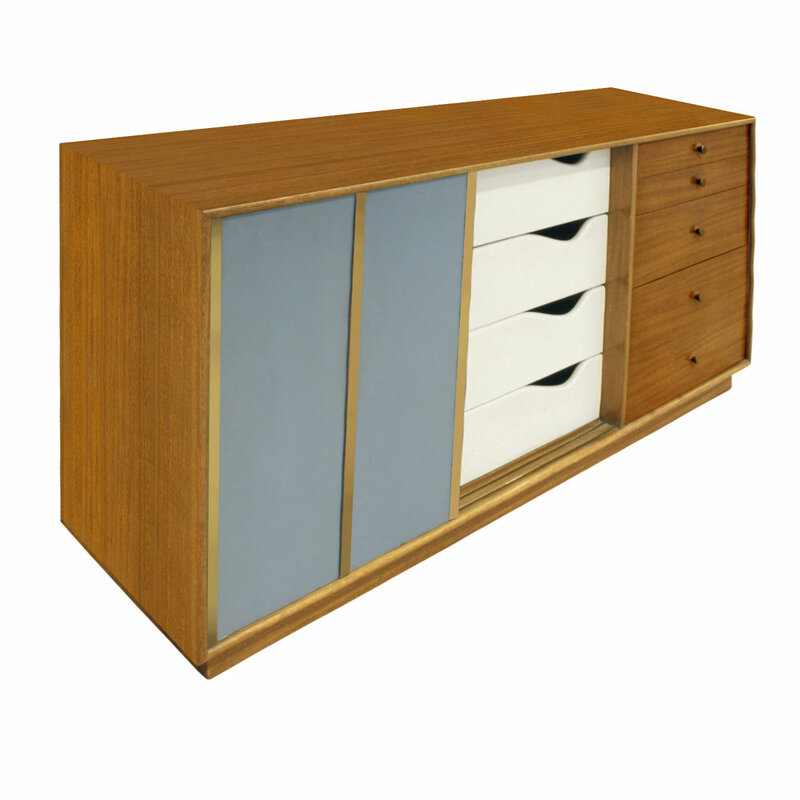 140, lacquered blue with iconic etched chrome hardware, by Tommi Parzinger for Parzinger Originals, American 1960's. 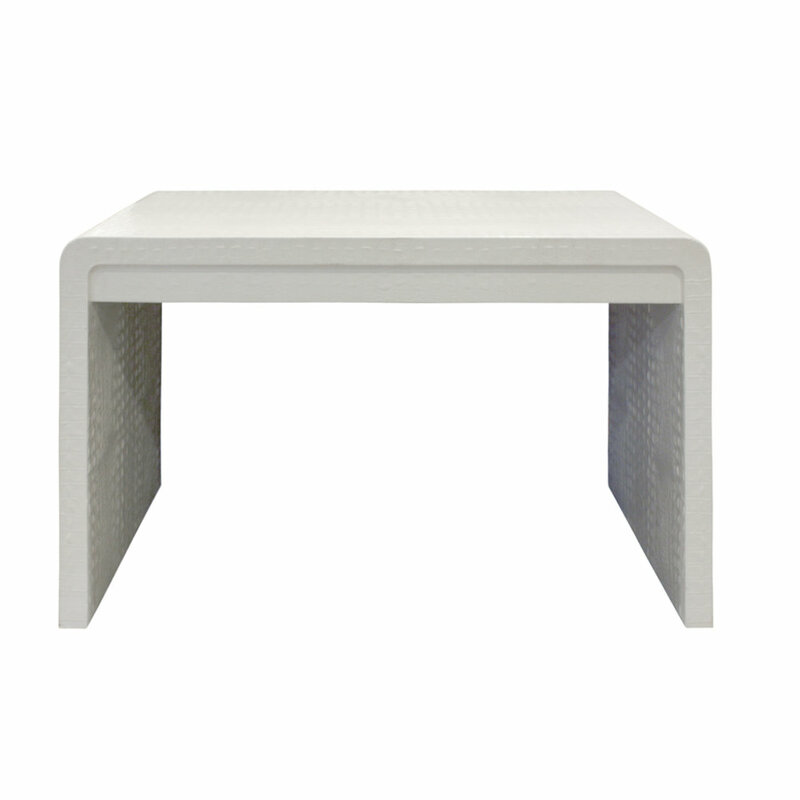 This is a beautiful example of Tommi Parzinger’s refined design sensibility. 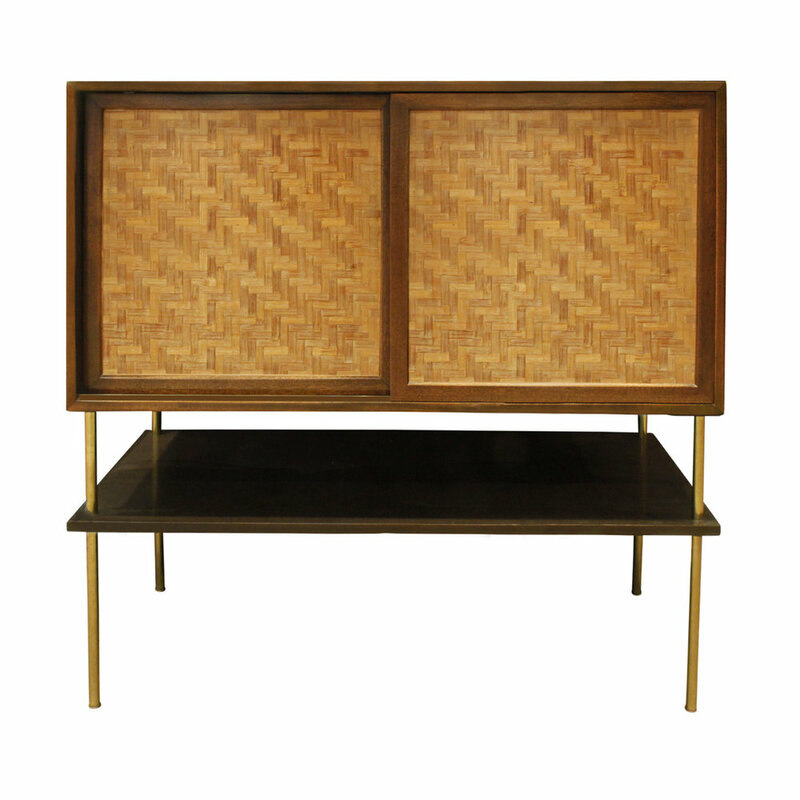 Rare and important cabinet in black lacquer with iconic brass hardware and floating glass top by Tommi Parzinger for Parzinger Originals, American 1960's. 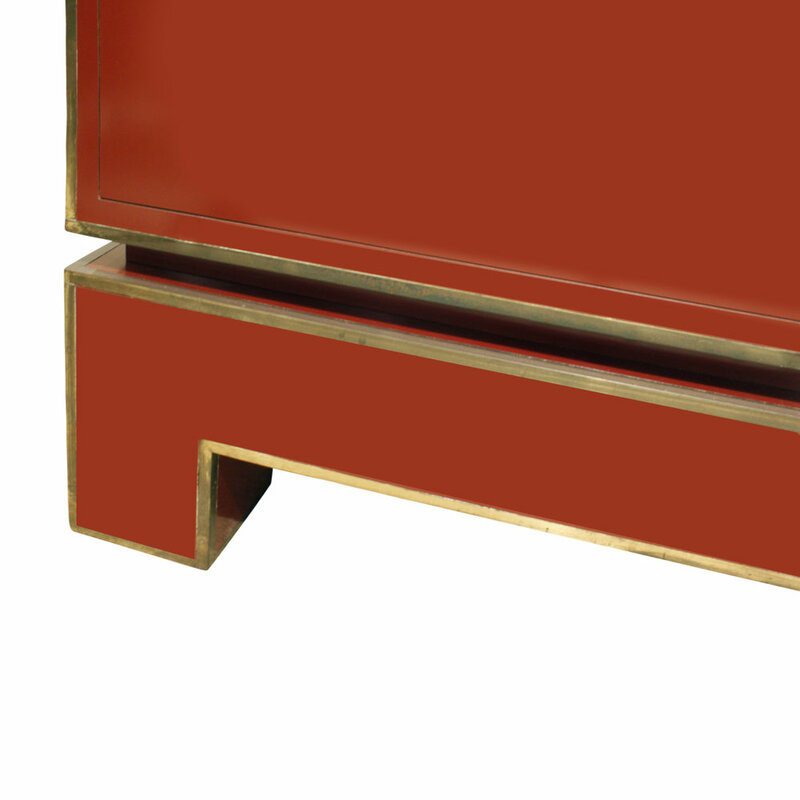 4 Door credenza in red lacquer with brass trim by Alain Delon for Maison Jansen, France 1970's. 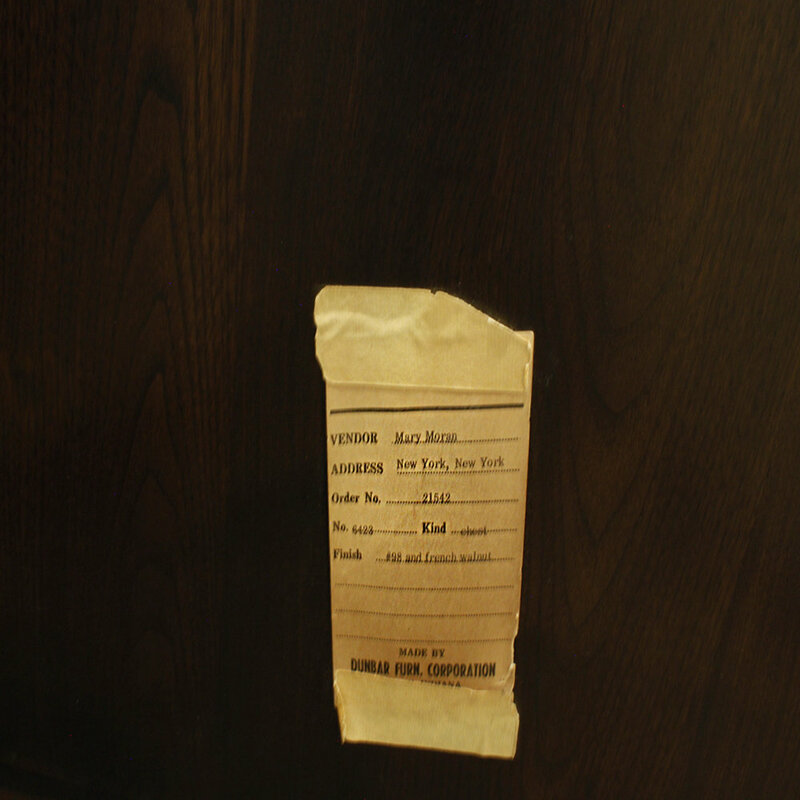 Signed “ADelon” on brass label on interior of far left door. 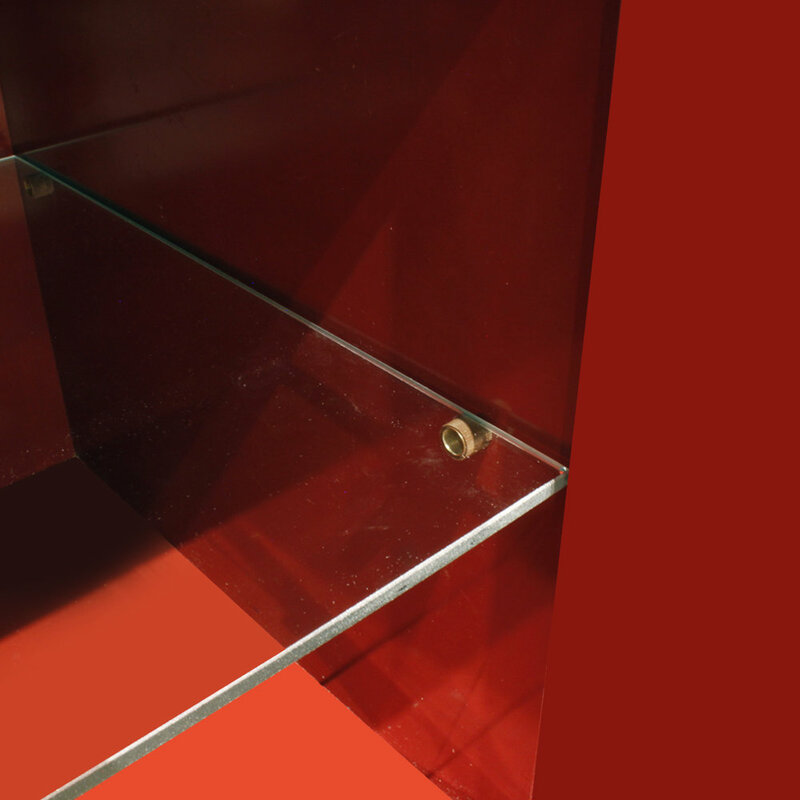 There are glass shelves inside. 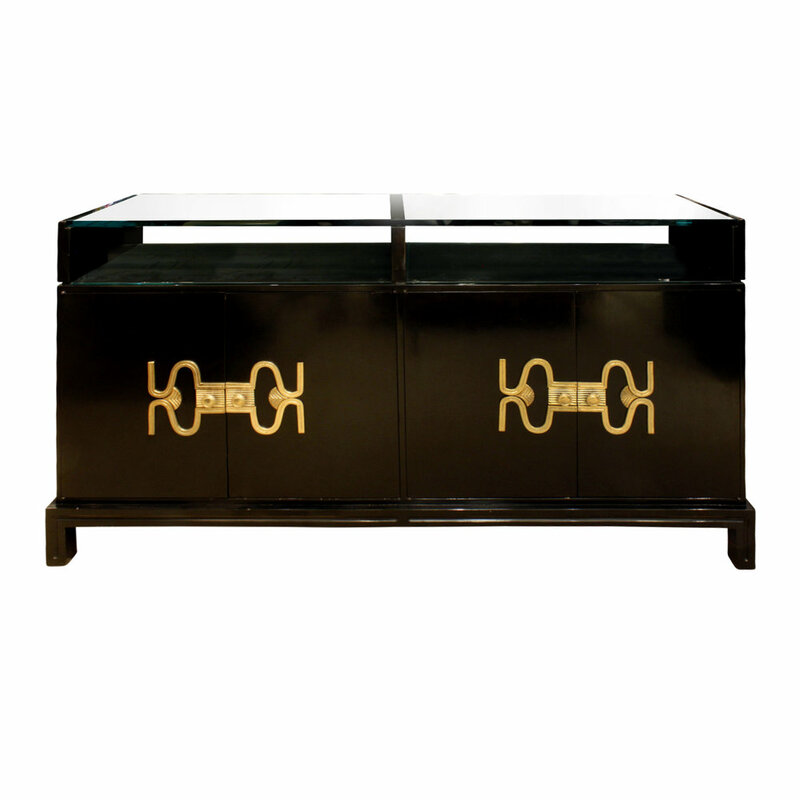 This is a very chic credenza. 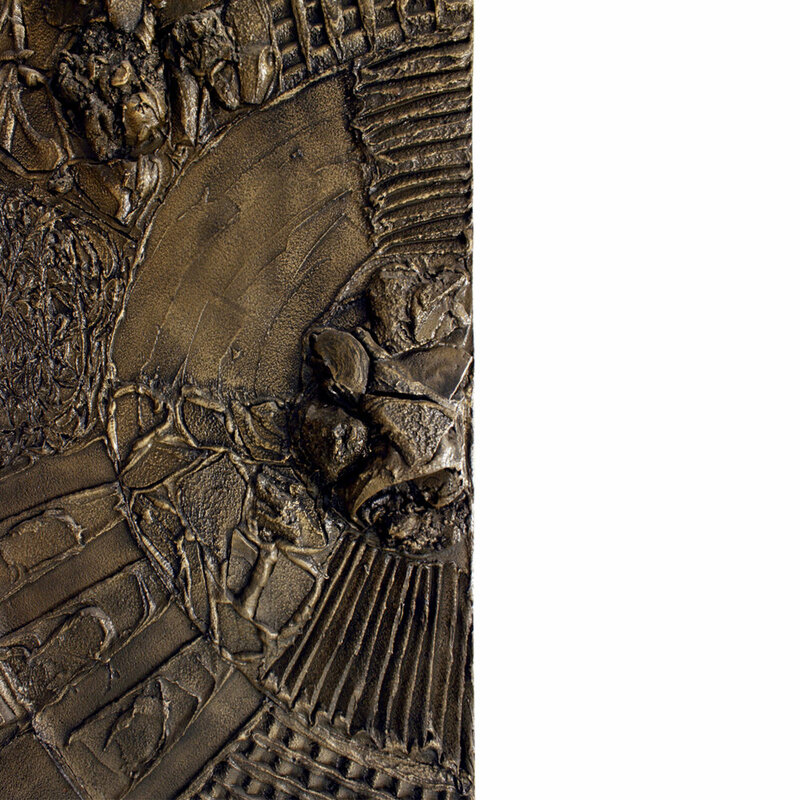 Condition: Very good - some patina to brass giving it a bronze look. 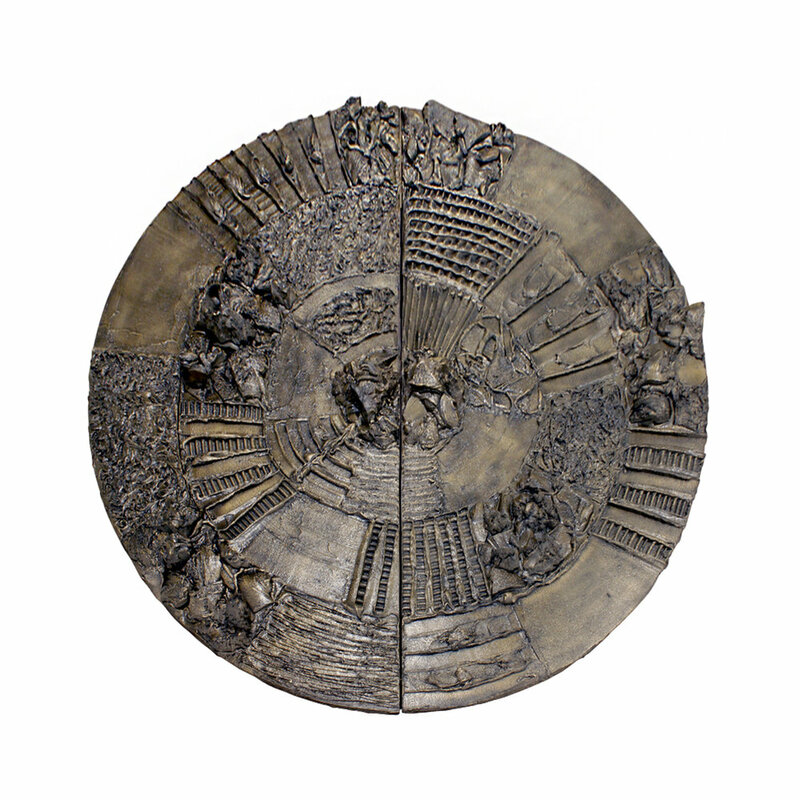 Rare and important wall mounted Sculptured Metal Disc Bar model PE 122 in bronze composite with red wood interior with vinyl wrapped shelves by Paul Evans for Directional, 1969 (signed “PE 69”). 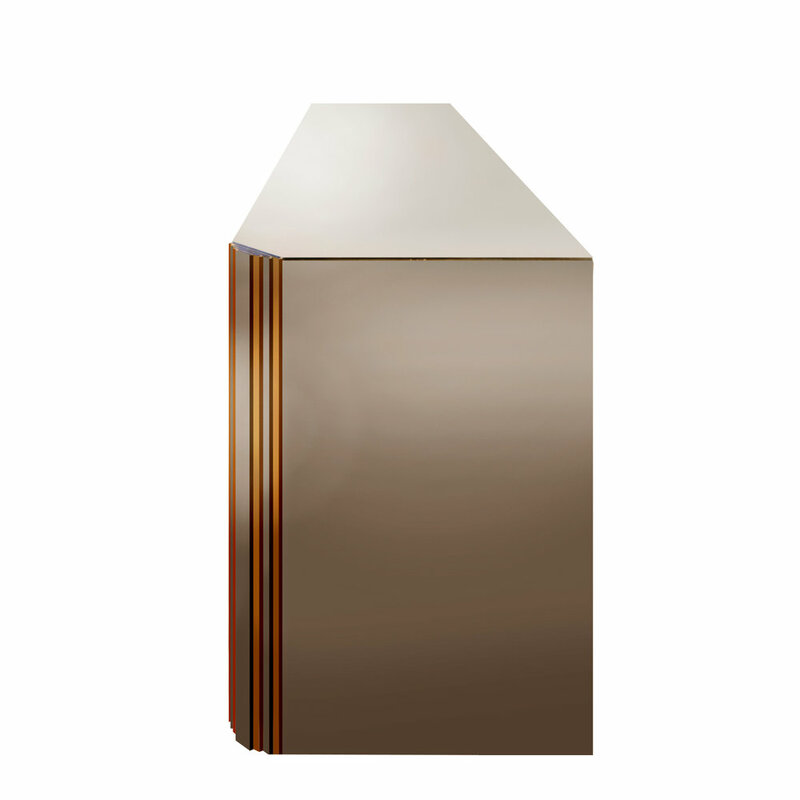 This is a tour de force and an iconic Evans design.